“So much of who we are is where we have been.” -William Langewiesche. I found this quote written in graffiti on a wall in Paris near the Seine River, and it resonated with me as I progressed through studying abroad. 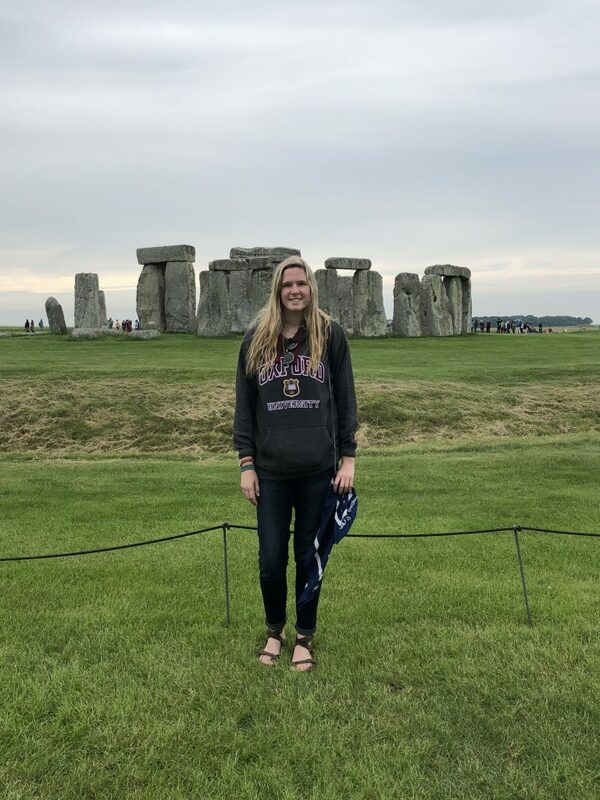 I felt myself becoming more adventurous, where I traveled by myself to Belgium, Luxembourg, and Stonehenge. 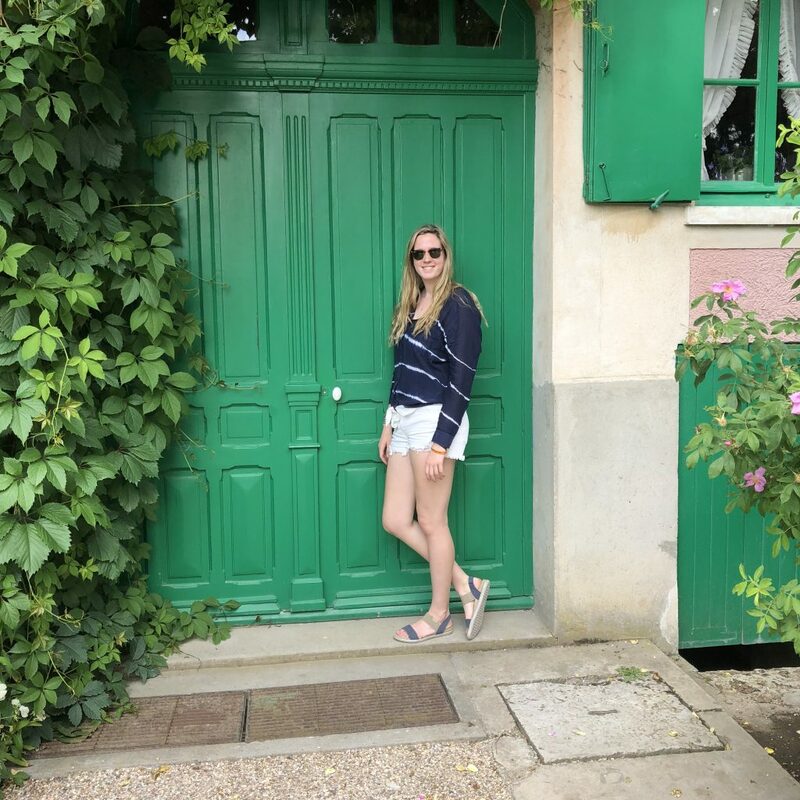 I felt myself becoming more comfortable speaking a language I had never studied before, where I was not afraid speaking French with locals. I felt myself falling in love with Paris. So much of who I am will remain in Paris. Bread will never be the same. When it comes to bakeries, the French have this perfected to an art. I probably ate my weight in croissants and baguettes, but French bread is incredibly delicious. My favorite dessert, and what I will miss the most about French food, is Pan du Chocolat (chocolate-filled croissant). Hopefully I can find an authentic French bakery in Michigan! Travel. Travel. Travel. Traveling within Europe is incredibly cheap and easy. When are you ever going to live in a foreign country again in your life? Take advantage of every opportunity and leave no stone unturned. 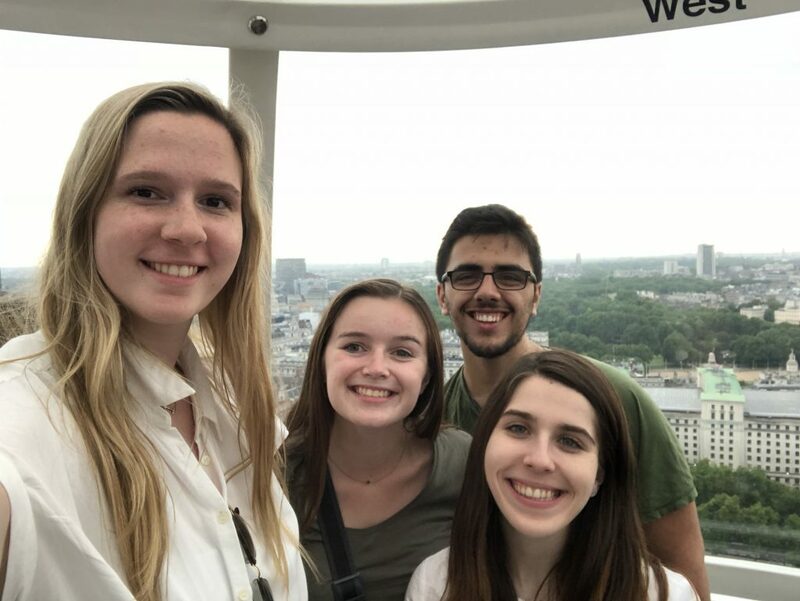 My group and I went to London, England together, and I went to Brussels, Belgium and Luxembourg City, Luxembourg by myself. 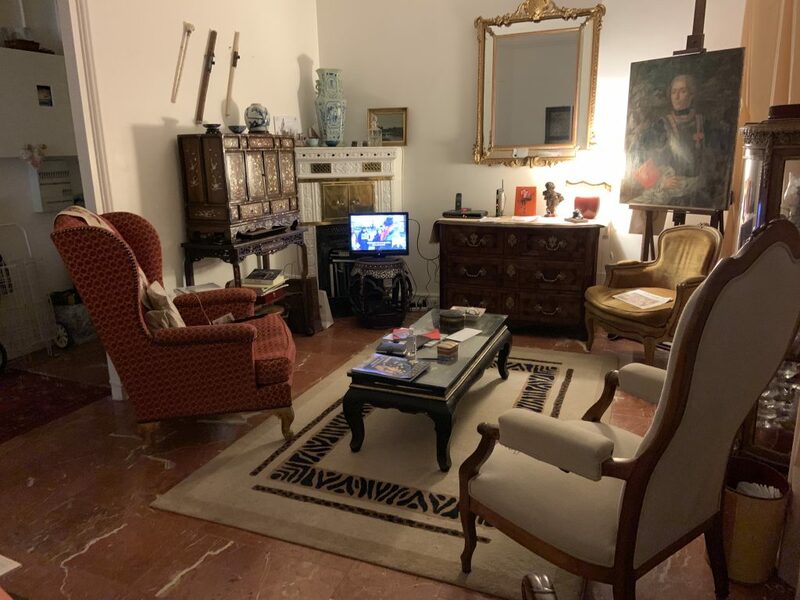 My group was more interested in exploring Paris than traveling far, but I didn’t let that falter my plans. Even if you have to go alone, don’t regret not going somewhere. I had a blast both on my own and with my group. Also, I learned how to book travel accommodations and research places to go all on my own. When my flights were delayed and trains became cancelled due to strikes, I figured out alternate routes on my own last minute. How cool is that? Travel, and travel far. The Eiffel Tower never gets old. From the first time I saw the Iron Lady to the last night under the sparkling lights, I never grew tired of looking at how beautiful the tower is. 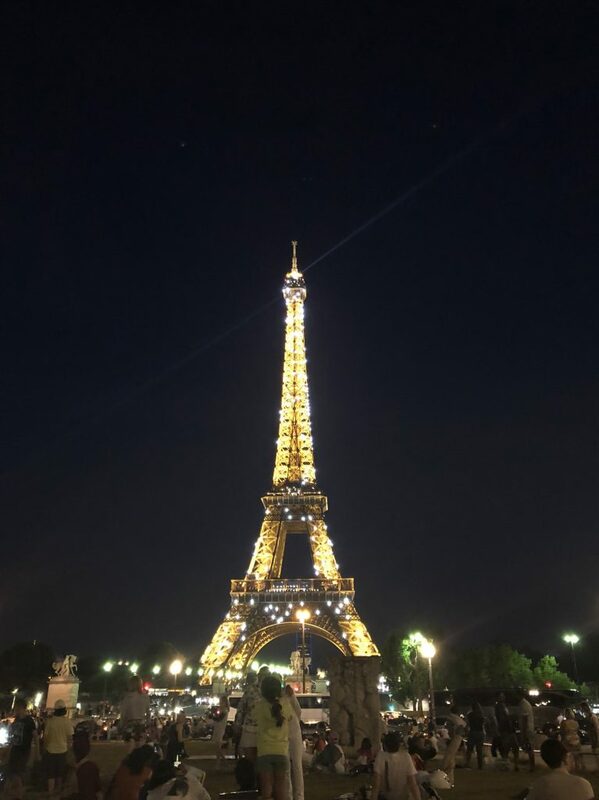 Every Wednesday, my friends and I had a picnic under the tower to watch the sunset and sparkling lights. I always looked forward to every Wednesday, and could not get enough of the Eiffel Tower. 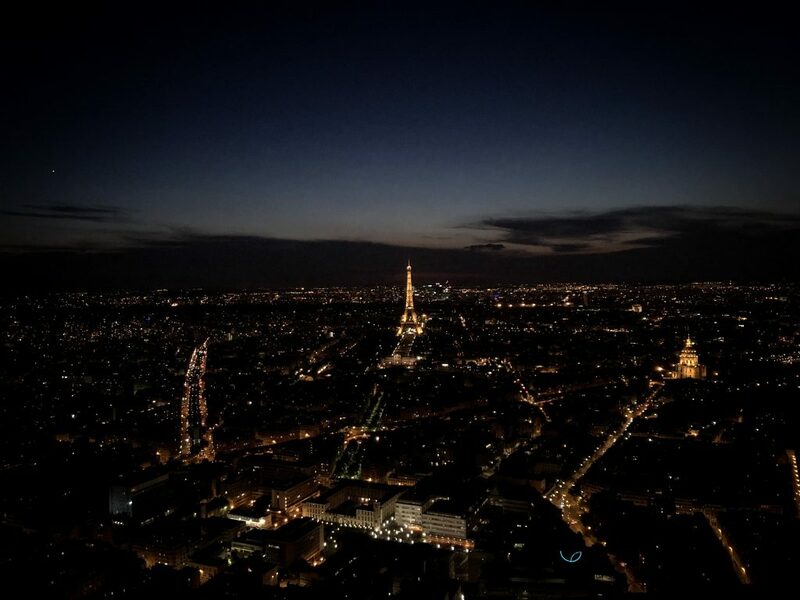 The view from the top of the tower isn’t bad either, but I’d much rather watch the lights sparkle with a baguette and wine from our secret terrace we found. Take the leap and study abroad. I have to admit, I was a little nervous just before I left. I had never traveled on my own before and had never been to Europe. I would have to learn a new language and learn to navigate a foreign country. Luckily, the nerves went away the second I got to my apartment. 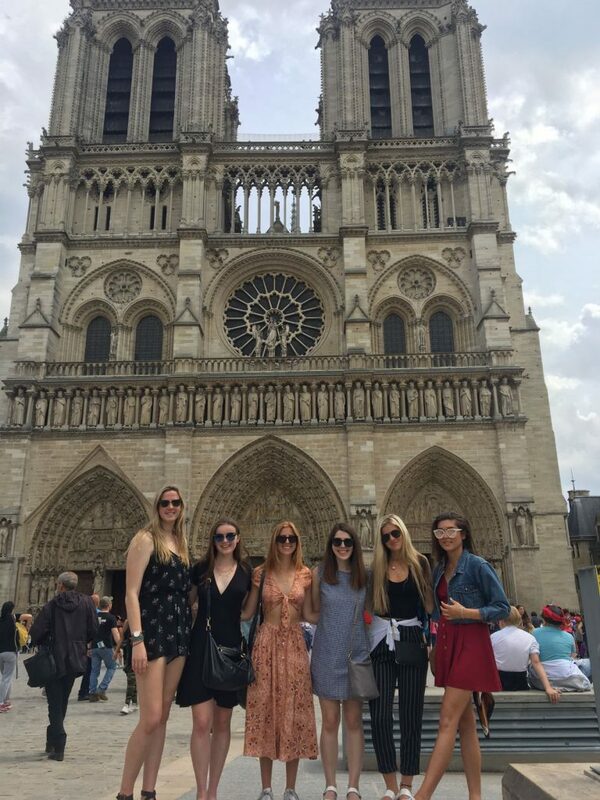 I fell in love with Paris and made incredible friends in my study abroad group. I learned a ton in my classes that I know will take me far in the rest of my studies. I created internship connections through my professors. I tried food I never thought I would dare eat. I traveled alone to other countries. I saw Stonehenge. Nothing will ever compare to what I experienced, and most importantly, I learned that a classroom is much more than four white walls. Take the leap and study abroad; you just might learn something about the world around you. À bientôt, et je t’aime Paris! 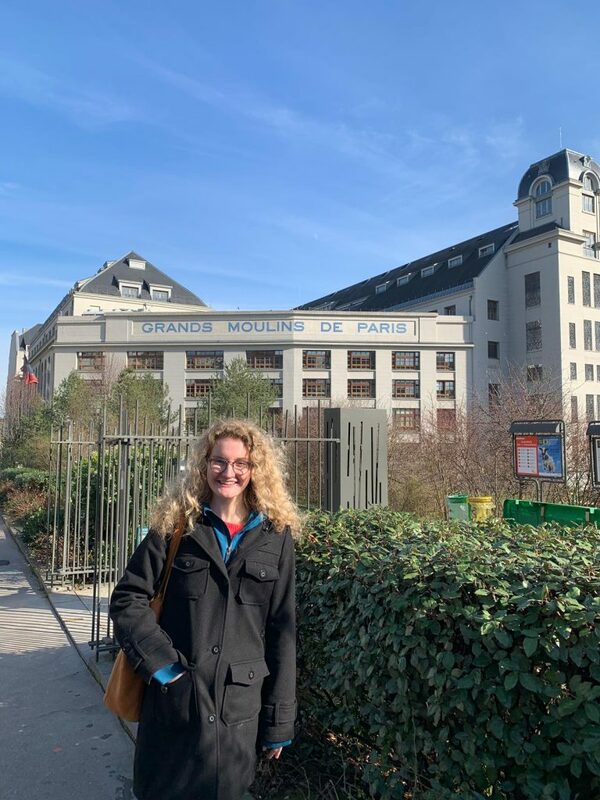 Posted on August 1, 2018 July 25, 2018 Author Alissa SmithCategories Academics, Culture, Daily Life, TravelTags Europe/France, IES, ies abroad, ParisLeave a comment on Paris Reflections! 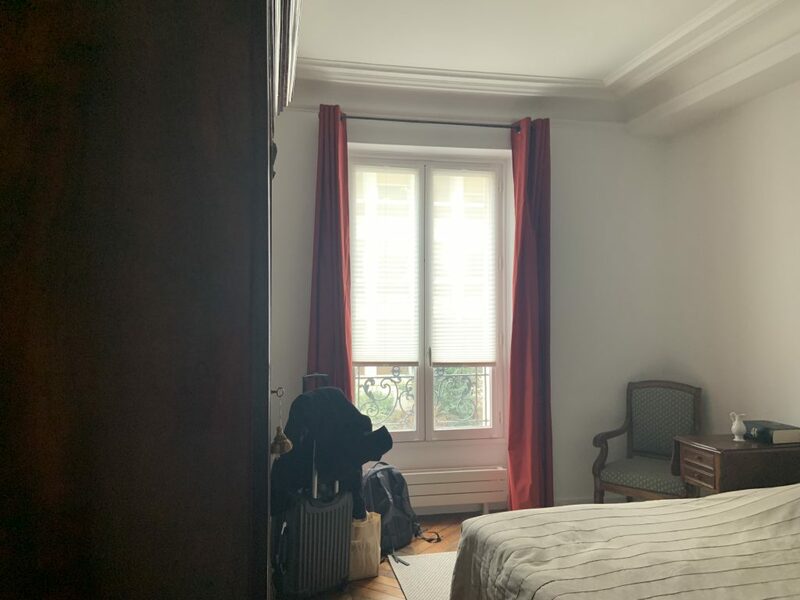 My Last Week in Paris! 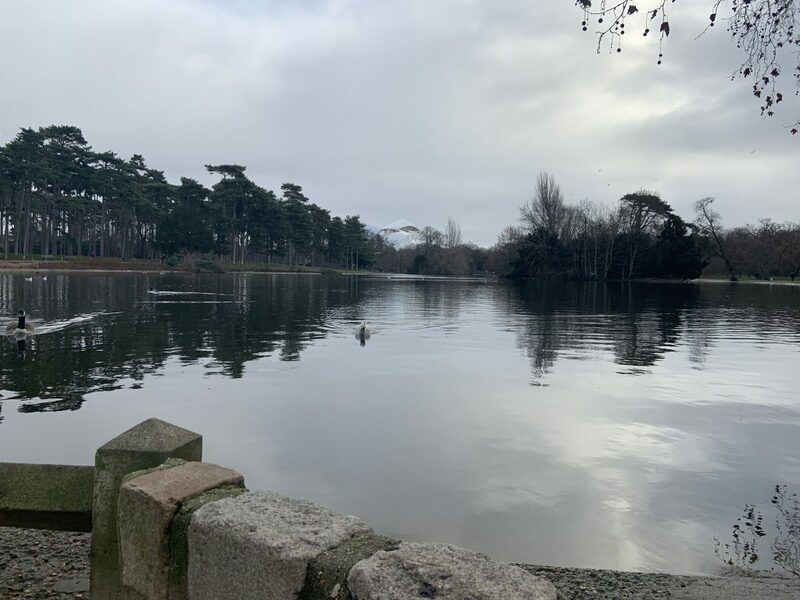 Finals week finally arrived for all of us at IES Paris! While I feel like I’ve only been in Paris for one day, it’s been seven weeks of unforgettable experiences. 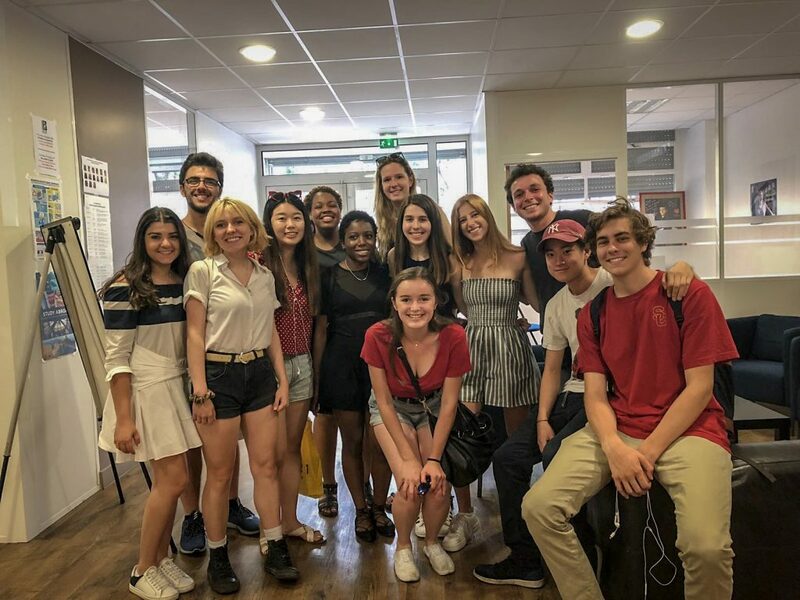 Since our finals happened to be on the Fourth of July, the staff at IES Paris decorated the IES center with American flags and streamers. Our professors and staff have been incredible to work with, and we’ve all become extremely close. It’s hard to turn in our last final, but we’ve all learned so much and made great internship connections. After we crammed for finals and turned in our exams, IES took everyone out to a fancy farewell lunch at a restaurant called Deuz. 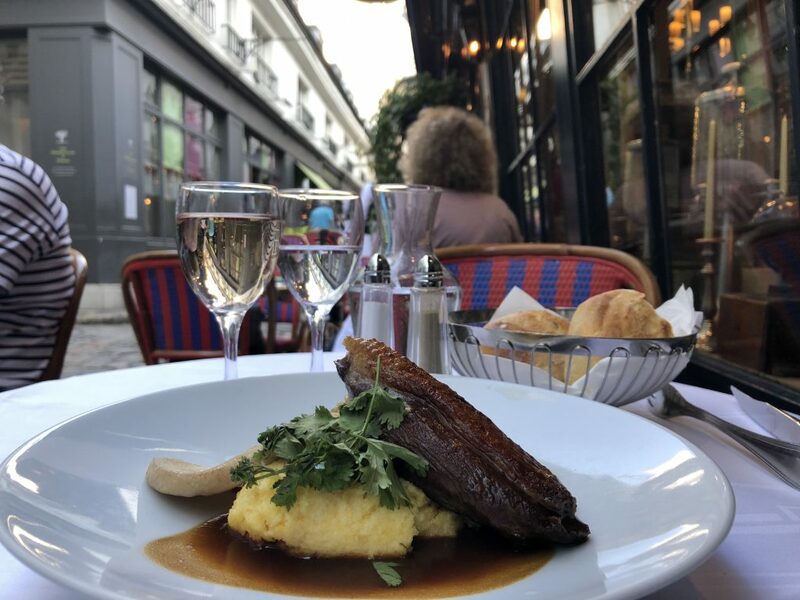 We were served fried eggplant rolls filled with goat cheese (sounds weird, but I promise it’s actually the best appetizer I’ve had), and some of the best duck in Paris with everyone at IES Paris. We were sad to say goodbye and we all hope to come back to Paris to visit everyone! Even though it was the last week, we still had some exploring left to do. We visited the Paris Mosque, which is one of the most beautiful and intricately decorated buildings in Paris. 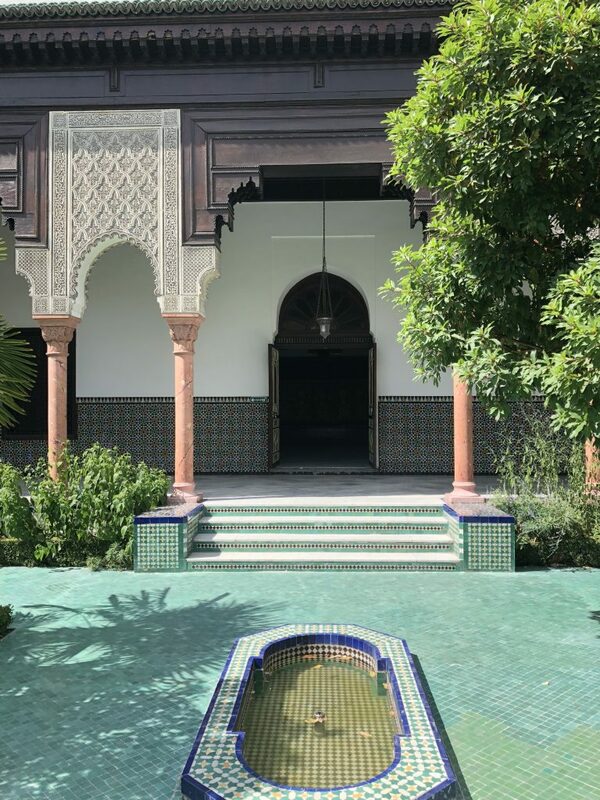 The bright blue tile floors were gorgeous in the sunlight, and the mint tea served there changed my life. Tea will never be the same. 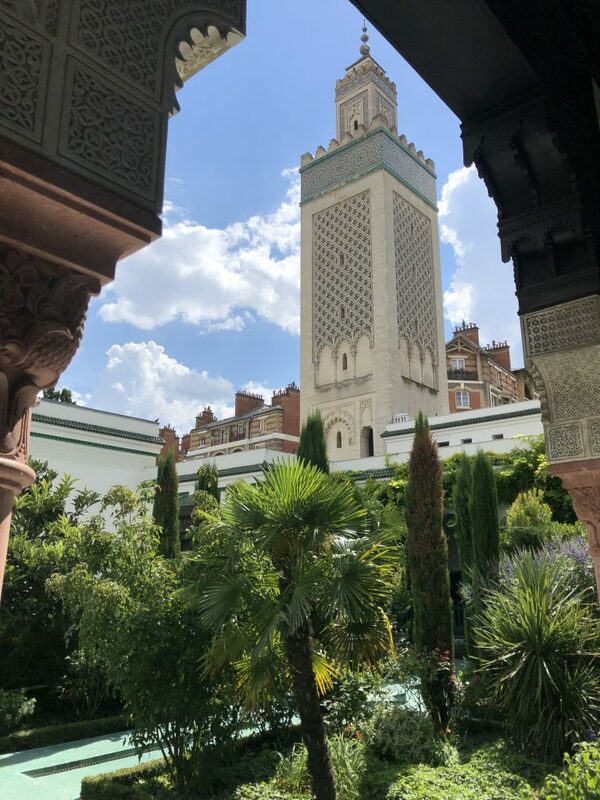 The gardens were beautiful, and since the Mosque is a hidden gem of Paris, we were able to enjoy the gardens in peace with no tourists. Shortly after, I explored the city visiting some of the places I still needed to cross off my list. One of these places was the famous Love Lock Bridge. 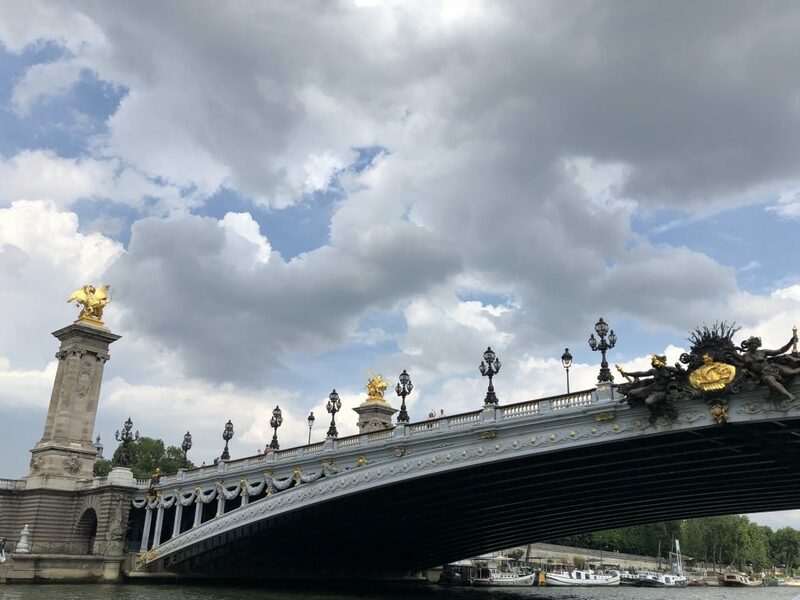 This bridge is an icon of Paris, but unfortunately Paris removes the locks each month to keep the bridge from collapsing. Although, I was not disappointed, as there were hundreds of locks on the bridge. 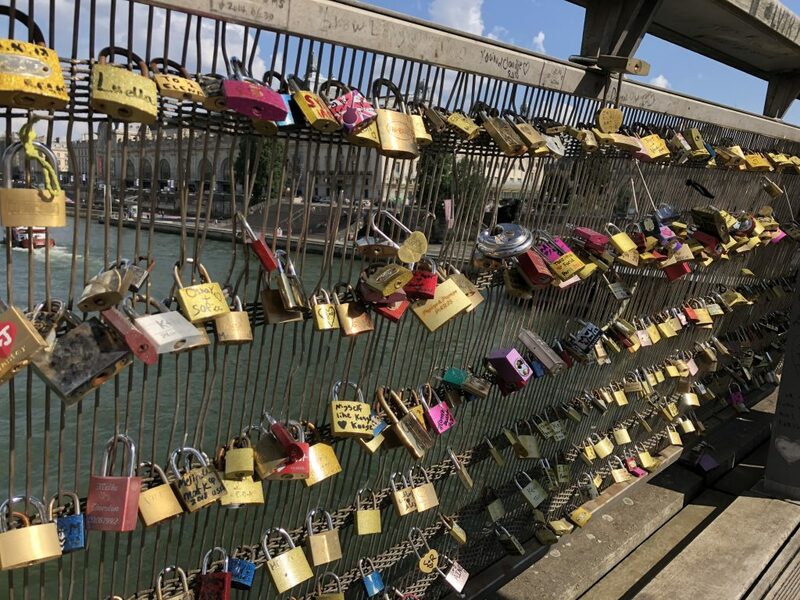 I hope to come back one day and put a lock on the bridge, as this ranks pretty high on my bucket list! For my last night in Paris, I decided to do something special for myself. I bought a ticket to the top of Montparnasse Tower, which is the tallest building in Paris. 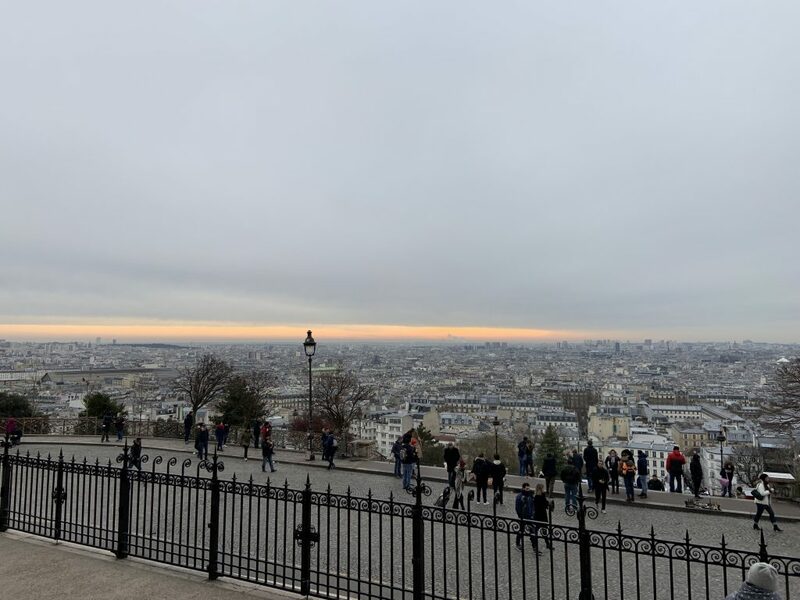 I stayed for the sunset and watched the Eiffel Tower sparkle at night. The view was breathtaking and I could see for miles beyond Paris. 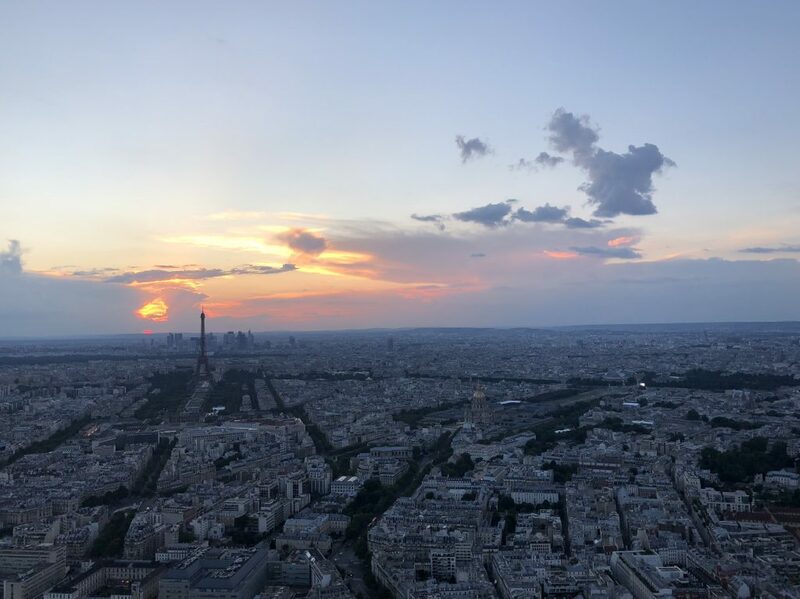 I enjoyed some fantastic chocolate mousse while watching the sunset from the skydeck, because when in Paris, why not?! It was a great way to close my summer semester in Paris and the view of the city is something I will never forget. 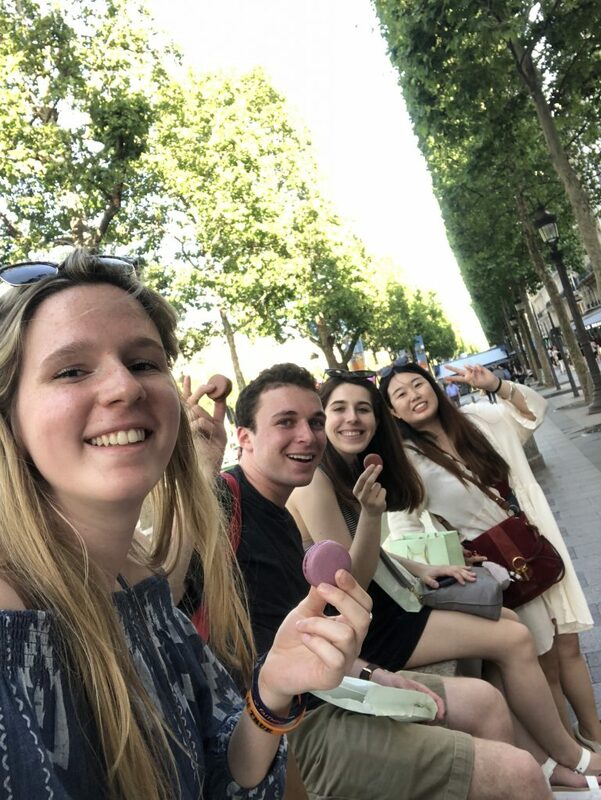 Posted on July 27, 2018 July 25, 2018 Author Alissa SmithCategories Academics, Culture, Daily LifeTags Europe/France, ies abroad, ParisLeave a comment on My Last Week in Paris! Musée d’Orsay, Top of the Eiffel Tower, and the World Cup! 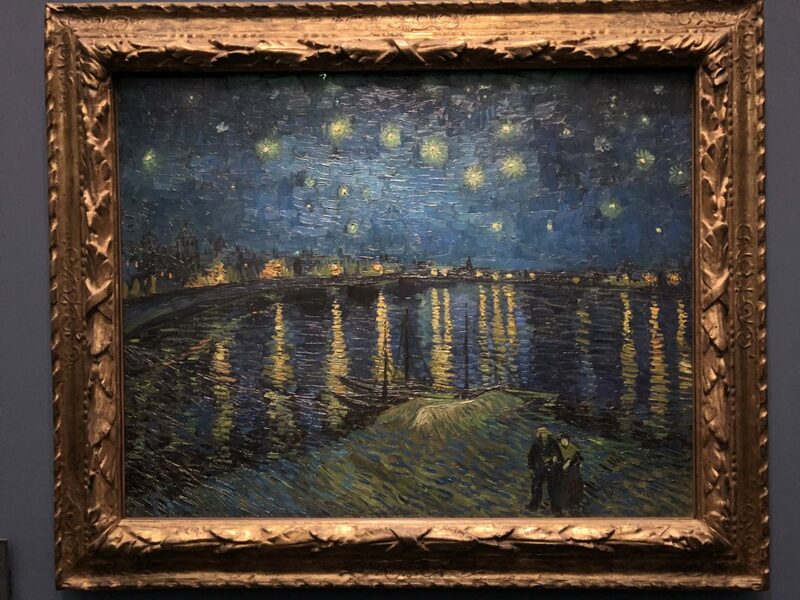 I was able to visit the Musée d’Orsay over the past week, which is a very unique museum. 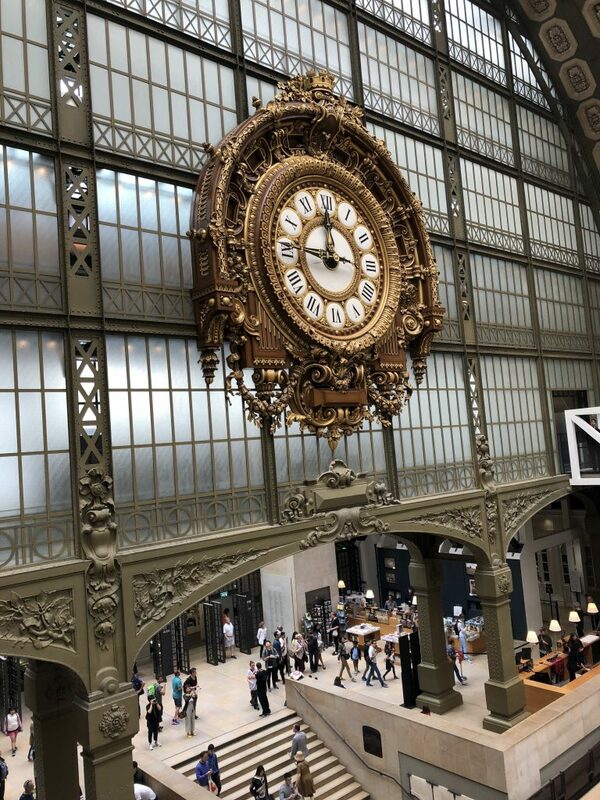 The museum itself is inside the old Paris train station, built for the Universal Exhibition of 1900. 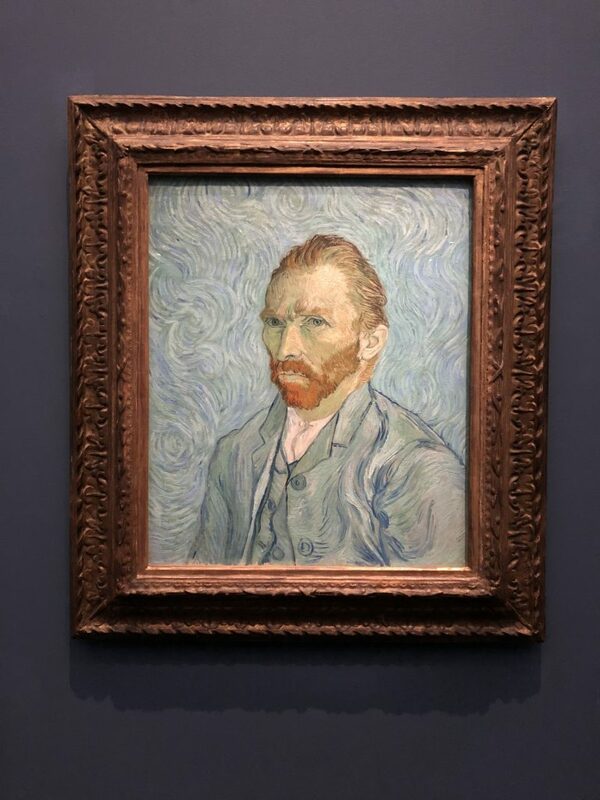 Musée d’Orsay houses several famous artworks, including an entire wing of Vincent van Gogh paintings. 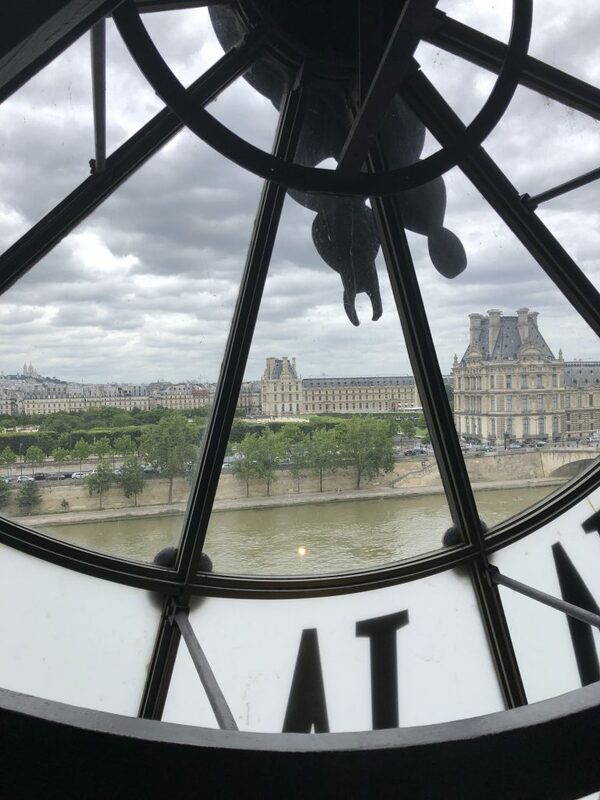 If you climb to the top floor of the museum, you can look out across the Seine and have a great view of the Louvre from behind the famous Orsay clock. 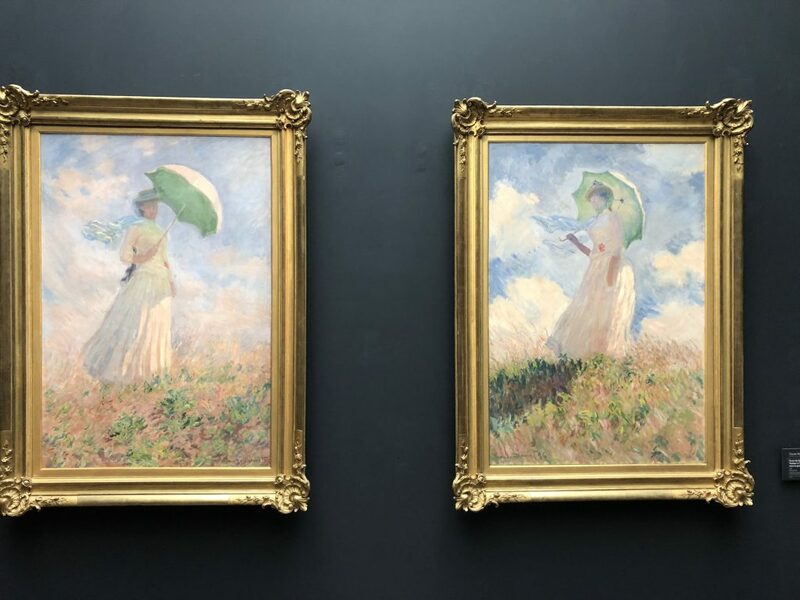 The Musée d’Orsay was one of my favorite museums in Paris and I can’t wait to come back soon! 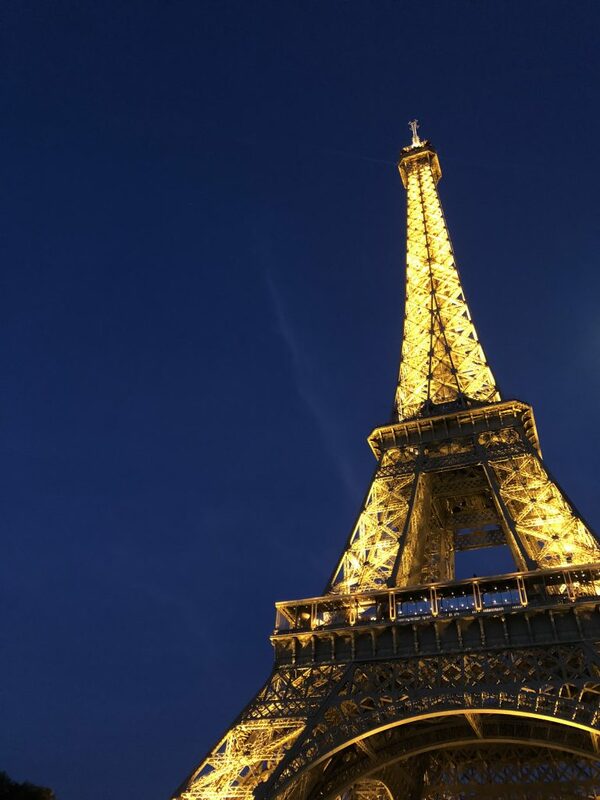 When in Paris, going to the top of the Eiffel Tower is on everyone’s list. Unfortunately, elevator tickets sold out months in advance, which meant I had to climb the 674 stairs to the top. The climb was not bad, as I had a great view at the top of every staircase. Once I finally reached the top, the view was breathtaking! I could see all of Paris and into the hills of the French countryside. The climb was definitely worth the hard work for the amazing views! (I treated myself to some French ice cream at the top of course). 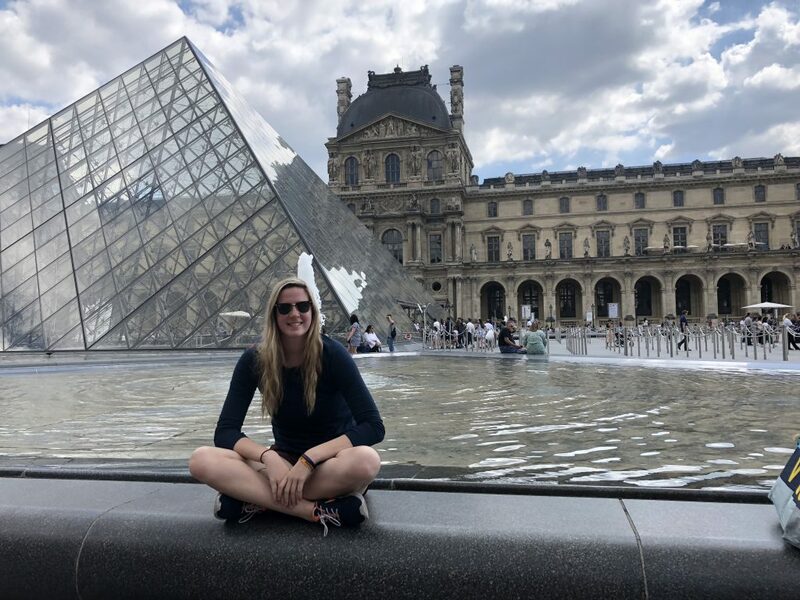 I was lucky enough to have to opportunity to study abroad during the World Cup. 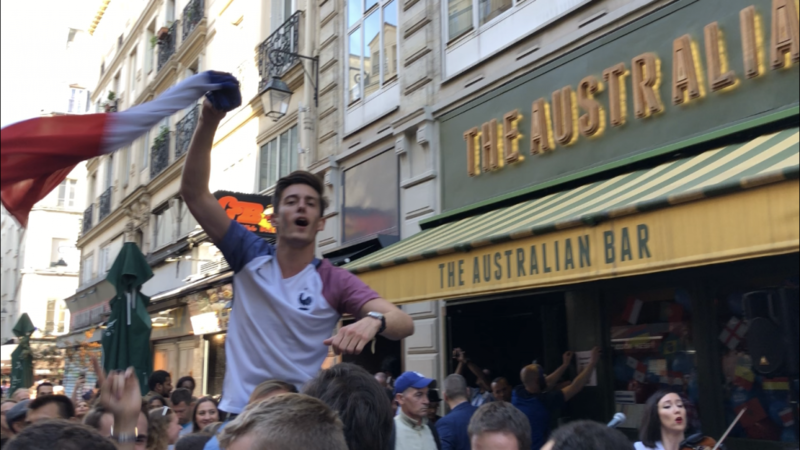 France has been playing exceptionally well in the tournament, which means all of Paris is constantly celebrating their victories. My group and I attended one of the World Cup watch parties on a Paris rooftop. The place was packed with French soccer fans, and everyone went wild when France scored to win the game against Australia. After the game, everyone took to the streets to celebrate the win. There was crowd surfing and free food, which made for an amazing day. The game also happened to be on the same day as Fête de la Musique, which is France’s national day of music. There were live music stages on every street corner, combined with the crazy energy of French soccer fans. This was definitely one of my top experiences in Paris! 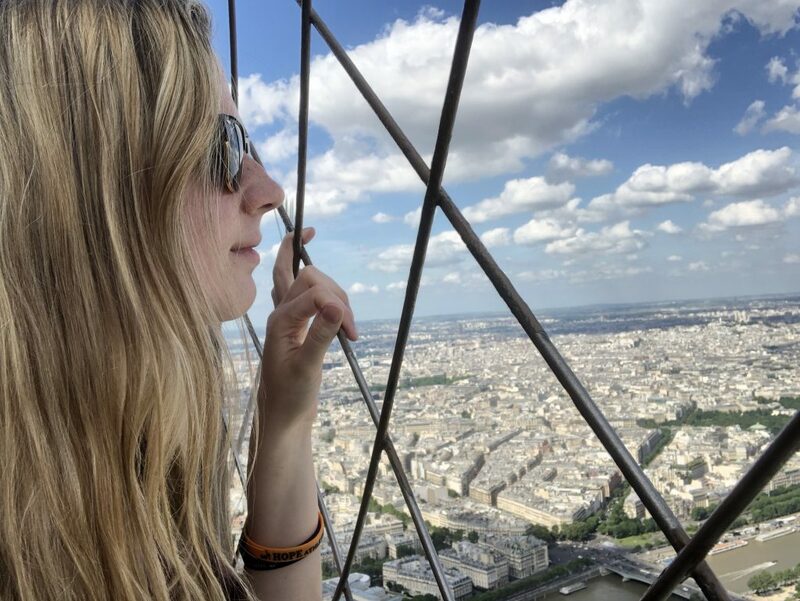 Posted on July 10, 2018 Author Alissa SmithCategories Culture, Daily LifeTags Europe/France, France, ies abroad, ParisLeave a comment on Musée d’Orsay, Top of the Eiffel Tower, and the World Cup! 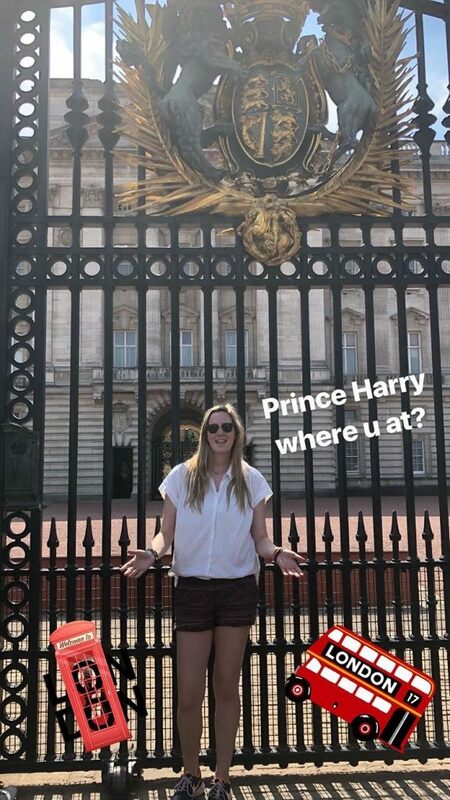 This past weekend my friends and I took a weekend trip to London! 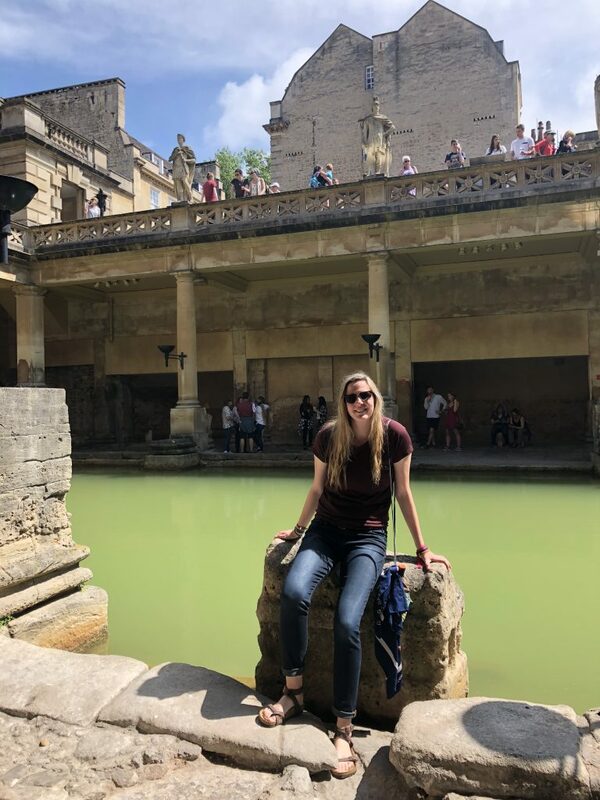 I booked an all-day tour to Windsor Castle, Roman Baths, and Stonehenge, which was definitely my favorite part of this study abroad experience so far! Anyone who knows me knows I am a huge history fan, so I was incredibly stoked for this tour. 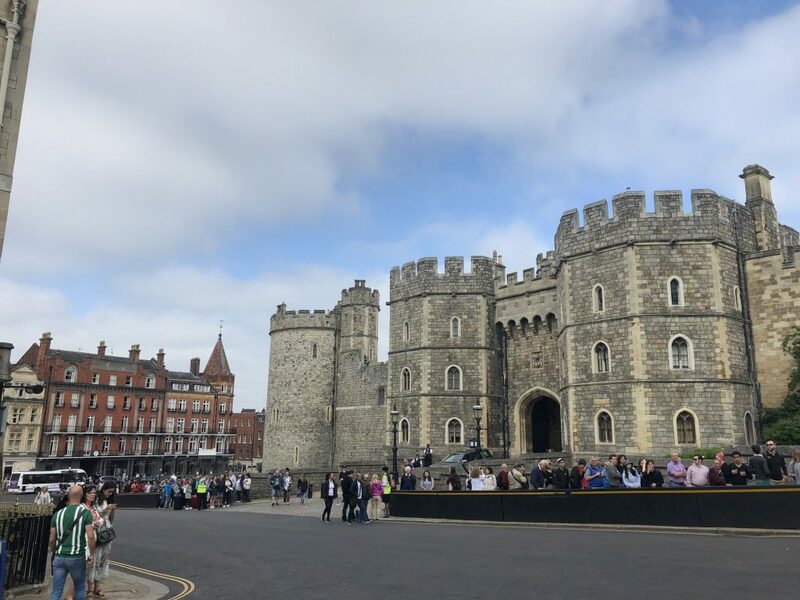 First we stopped at Windsor Castle, which is where Queen Elizabeth and Prince Philip live. As it turns out, we were in London for the Queen’s birthday celebration so all of London was decorated with photos of the Queen. 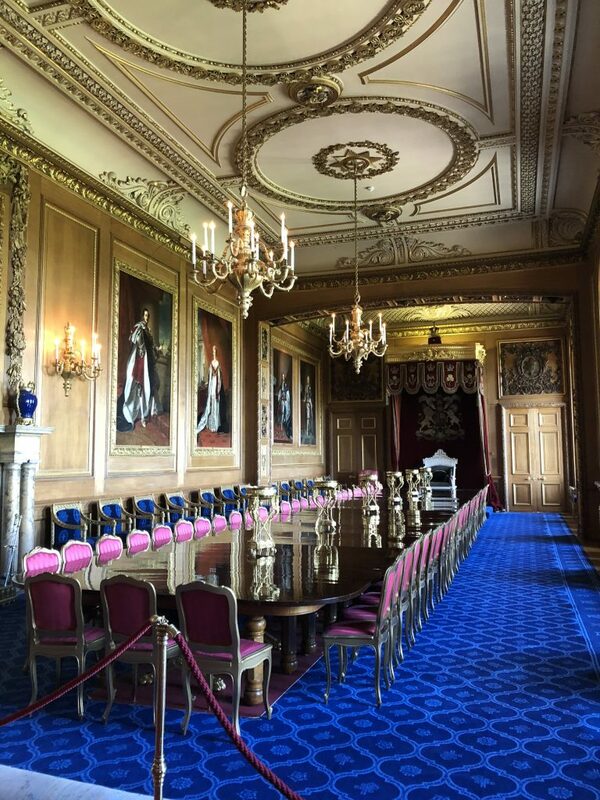 Windsor Castle is the oldest operating castle in Europe, and is one of the most beautiful castles I have seen. 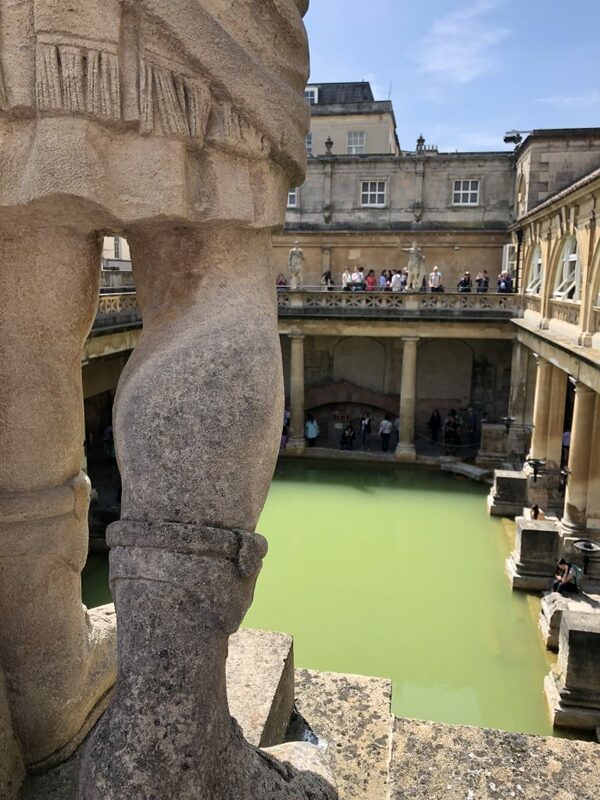 After Windsor Castle, we headed to the ancient Roman Baths, which is a UNESCO World Heritage Site. These baths are still running from the same hot spring the ancient Romans used. The baths had tons of Roman artifacts and I learned a lot about Roman life. 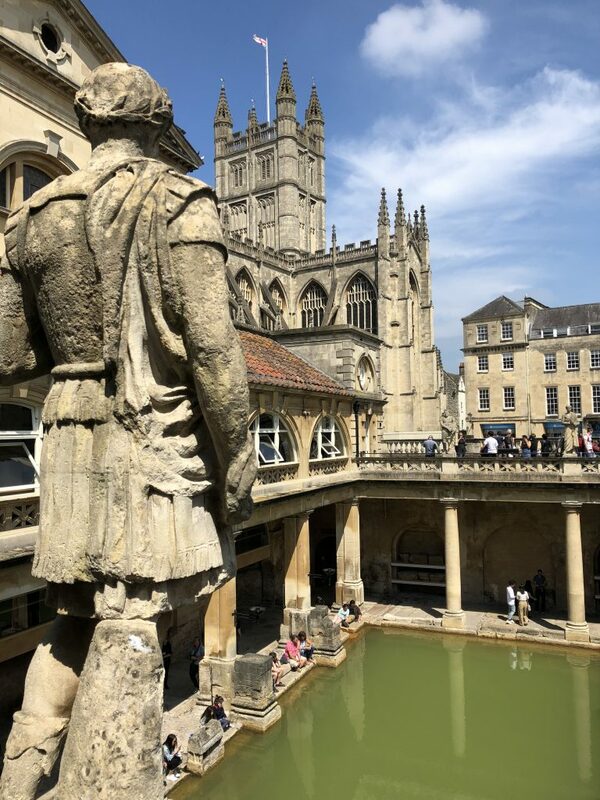 I definitely hope to come back to Bath, UK, to explore the beautiful city more! Lastly, and my personal favorite, we visited Stonehenge. 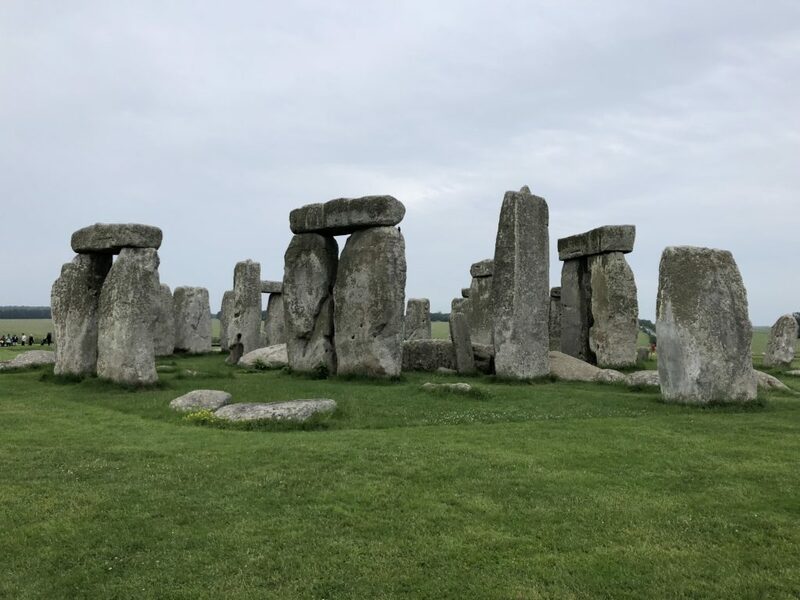 Stonehenge is in my bucket list top five, and I could not have been more excited to finally see a historical site that I have wanted to experience my entire life. Stonehenge is also a UNESCO World Heritage Site, so the UK definitely has a lot of history I cannot wait to come back and explore. Stonehenge has fascinated me since I was little, and I was happy to learn on the tour that Stonehenge is actually an astronomical calendar. On the summer and winter solstice, the sunset and sunrise line up exactly through the stone arches. 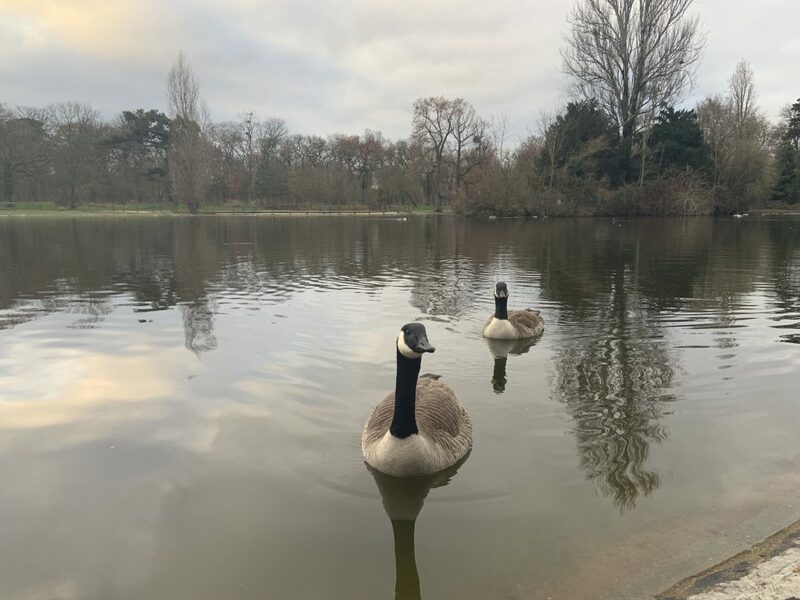 I had a ton of fun on this tour and saw some of the highlights of England! 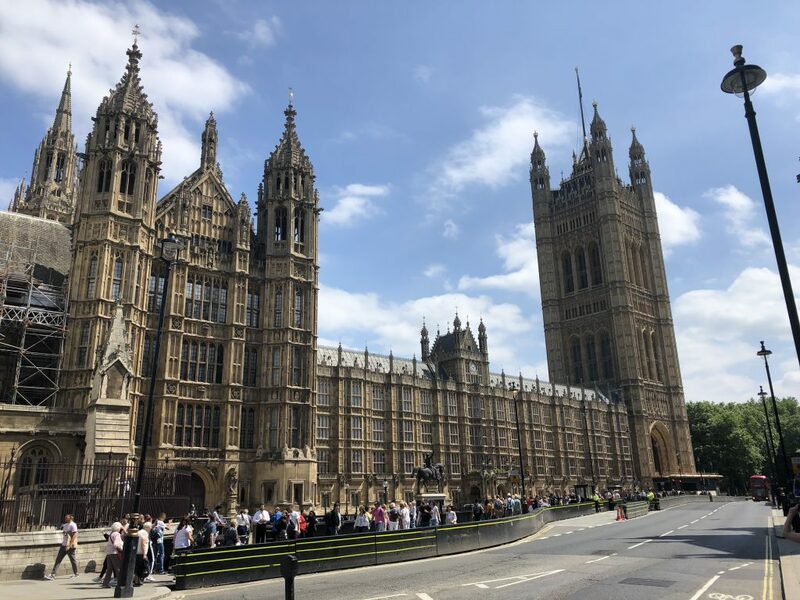 Unfortunately, Big Ben is under construction so we were not able to visit the famous Benjamin. Although, we toured every other spot in downtown London. I, of course, had to take a photo in the iconic red telephone booth! 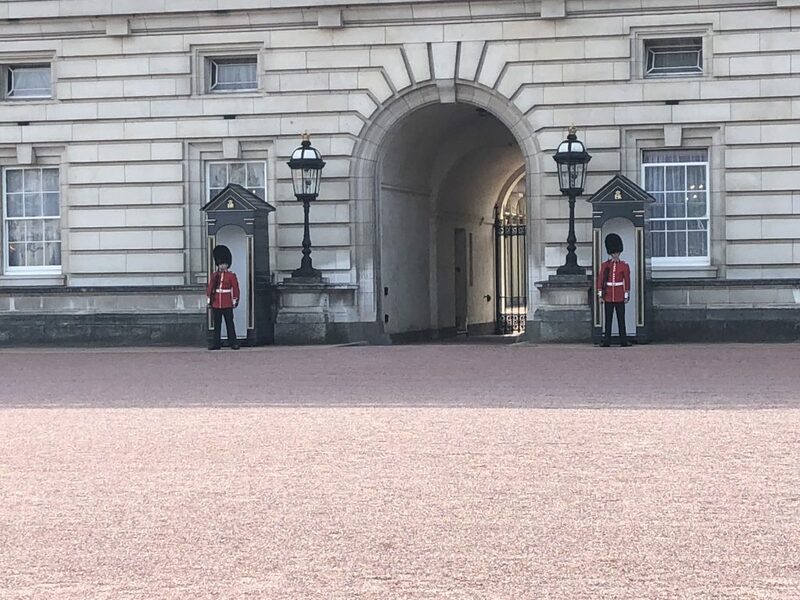 We also visited Parliament and Buckingham Palace, where we saw the famous British guards. 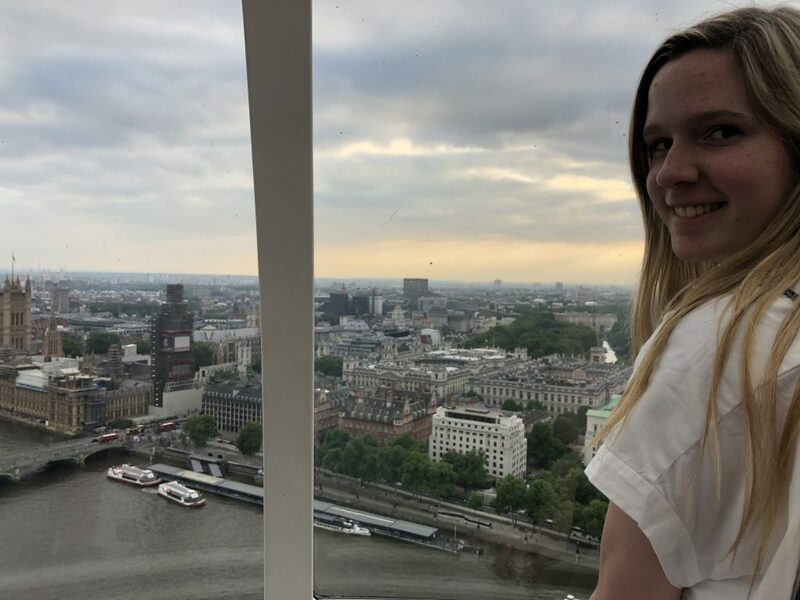 To cap off our fantastic weekend in London, we rode the London Eye and saw the best view of London! 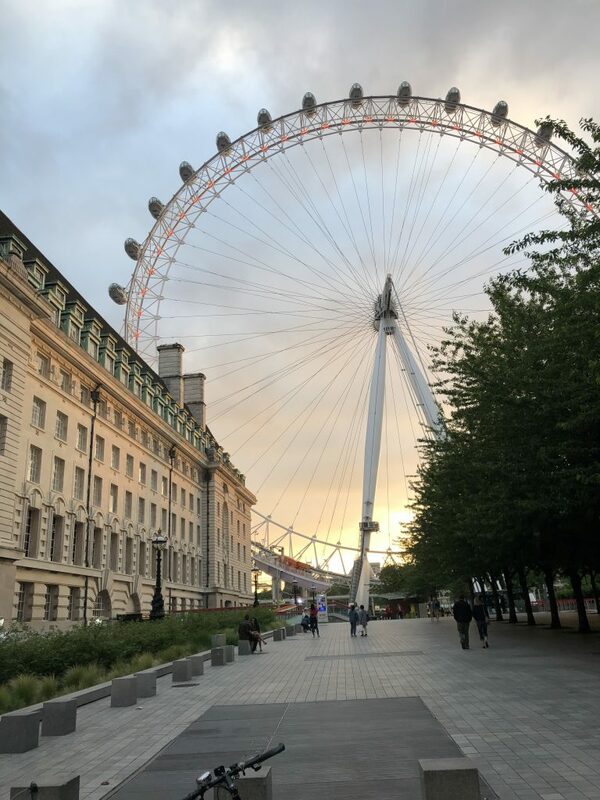 The London Eye was a lot higher than I thought, but was a memorable way to close our last night in London. Just before we left, our flight was delayed by several hours. 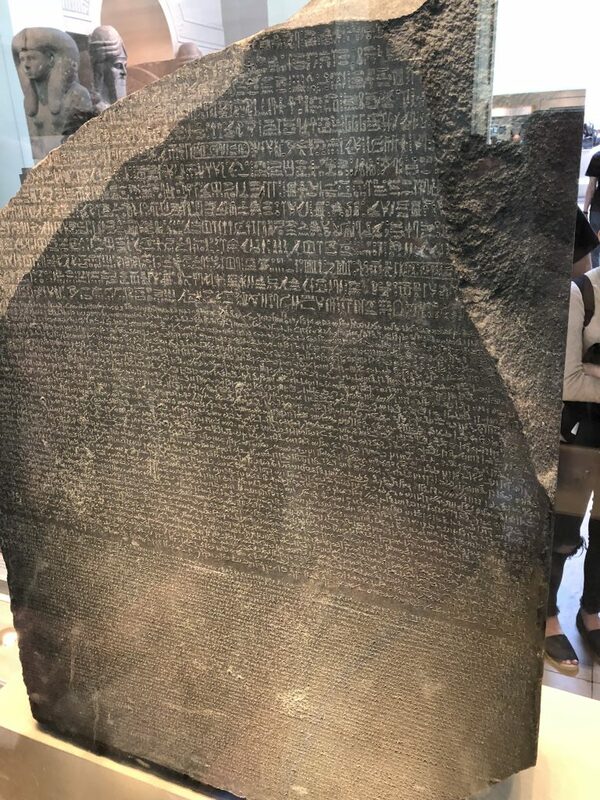 I was happy about this because it meant I had time to explore the British Museum! 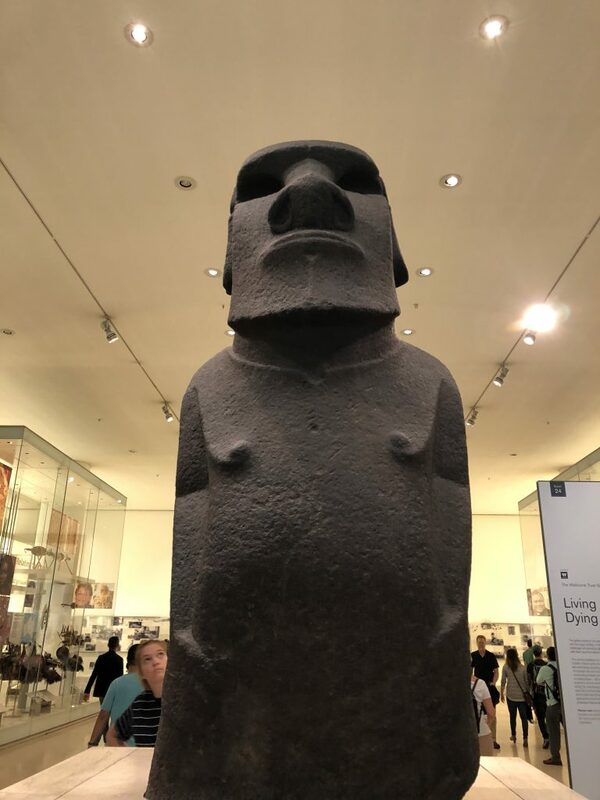 This was one of the best museums I have been to, and my favorite artifacts included the Rosetta Stone, the Elgin Marbles, and an Easter Island head. Experiencing more world history was a great way to close a fantastic weekend! 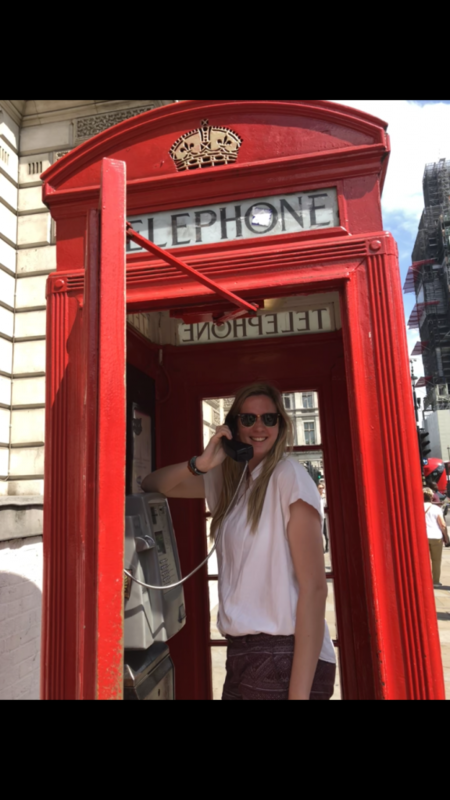 Posted on July 3, 2018 July 2, 2018 Author Alissa SmithCategories TravelTags Europe/France, Europe/U.K., ies abroad, LondonLeave a comment on London Calling! Claude Monet’s House and the Towers of Notre Dame! 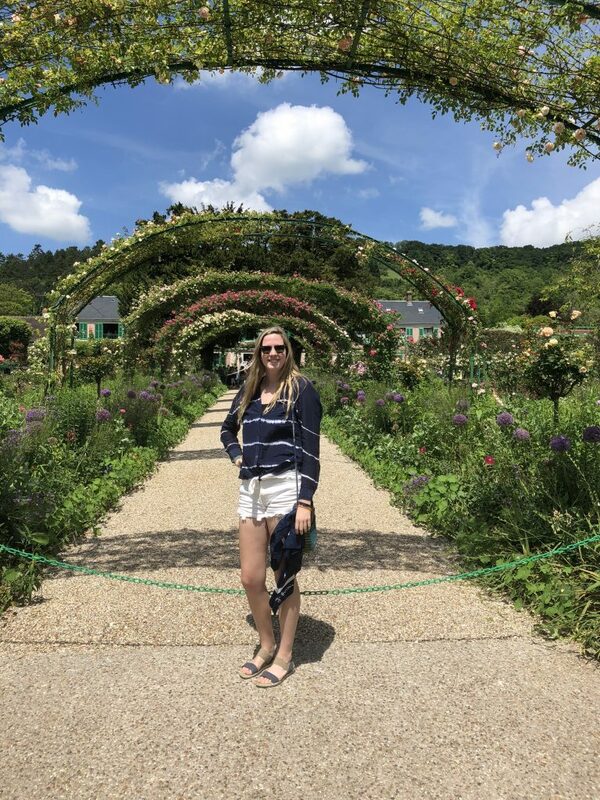 As an avid art fan, I was super excited to get the chance to go to Claude Monet’s house and gardens in Giverny. Giverny is a small countryside town in Normandy, France. 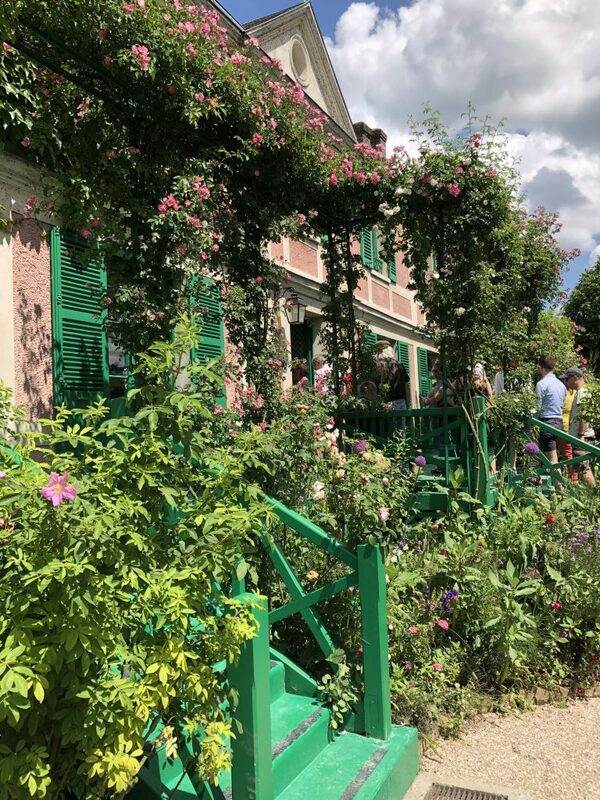 Giverny is famous for its rolling countryside hills and impressionist art history, which was a great change of scenery from the busy streets of Paris. 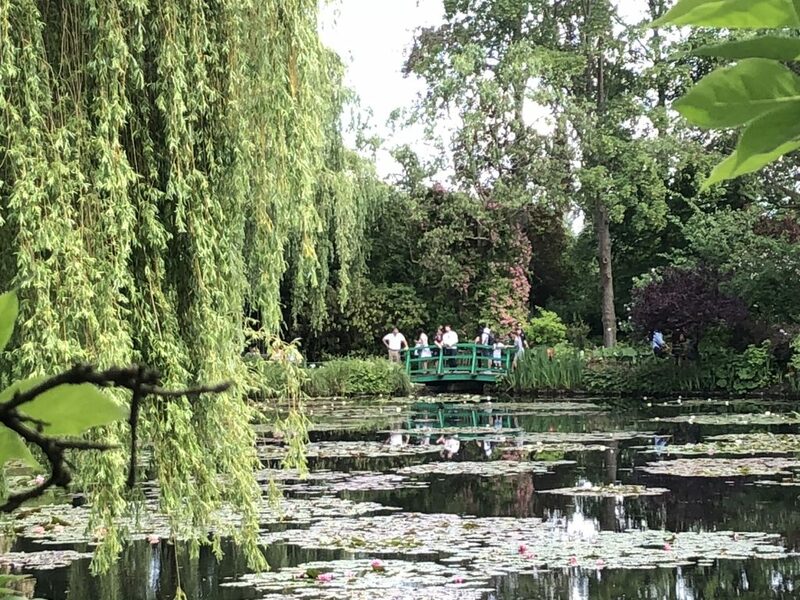 Monet’s estate is covered with sprawling gardens and the famous water lily garden. Walking through the gardens, I recognized several areas that inspired some of Monet’s most famous pieces. 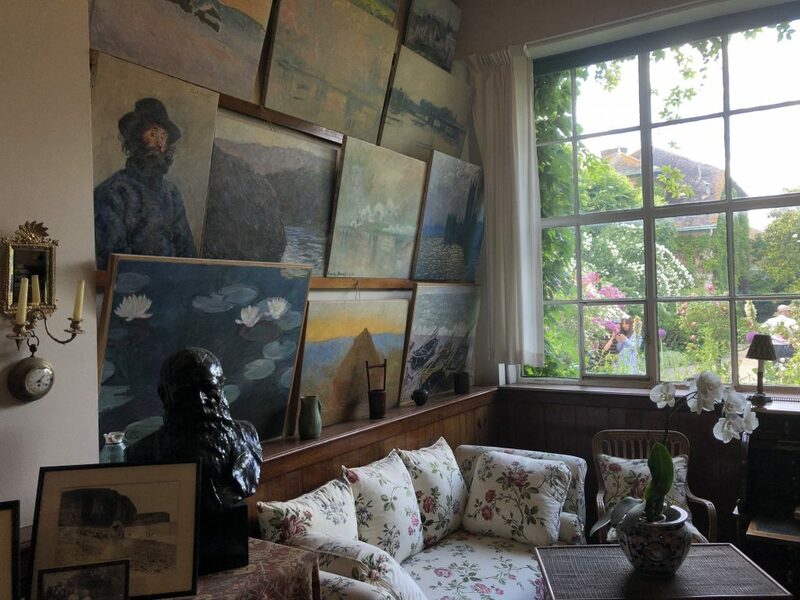 Monet’s house was filled with a ton of his artwork and sketchbooks. My favorite place was the water lily garden and green bridge that inspired Monet’s most famous painting. 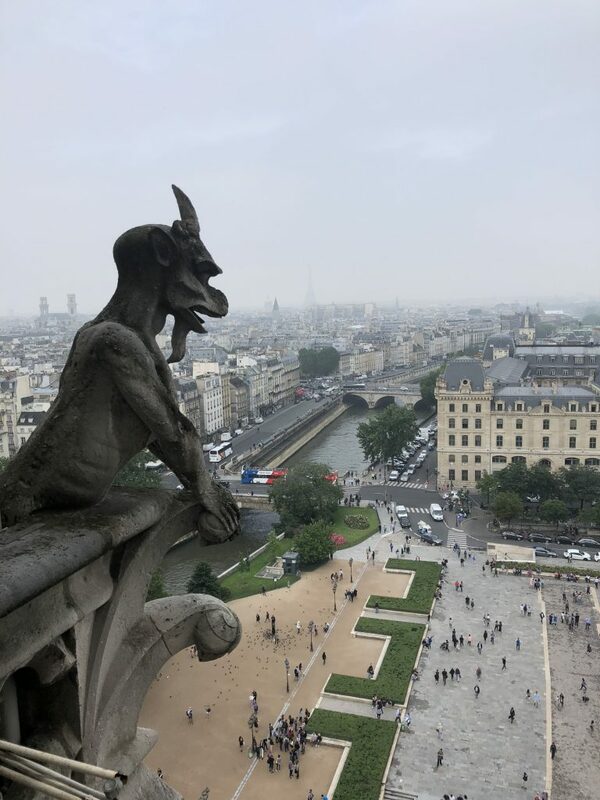 After returning to Paris from Giverny, I decided to climb the Towers of Notre Dame. 387 stair steps later, I finally reached the top. 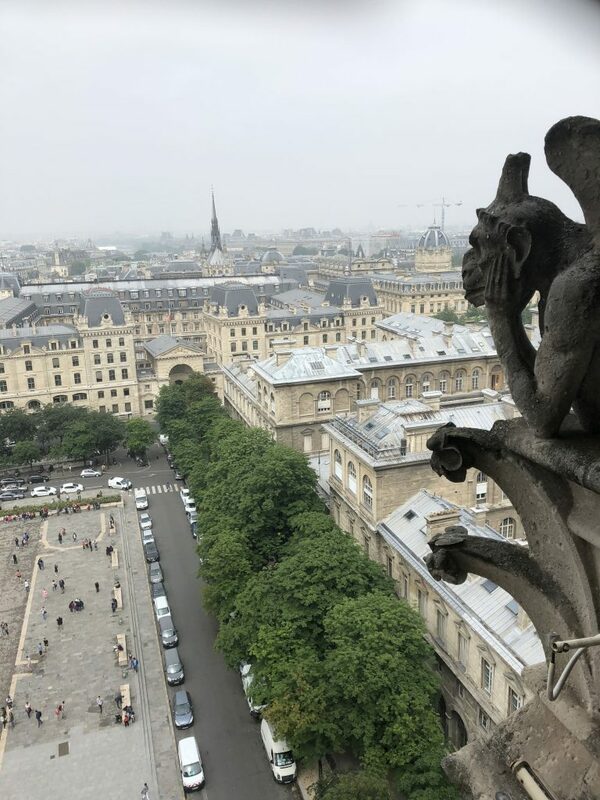 I instantly recognized the amazing view of Paris and stone gargoyles from the classic Disney movie, “The Hunchback of Notre Dame”. 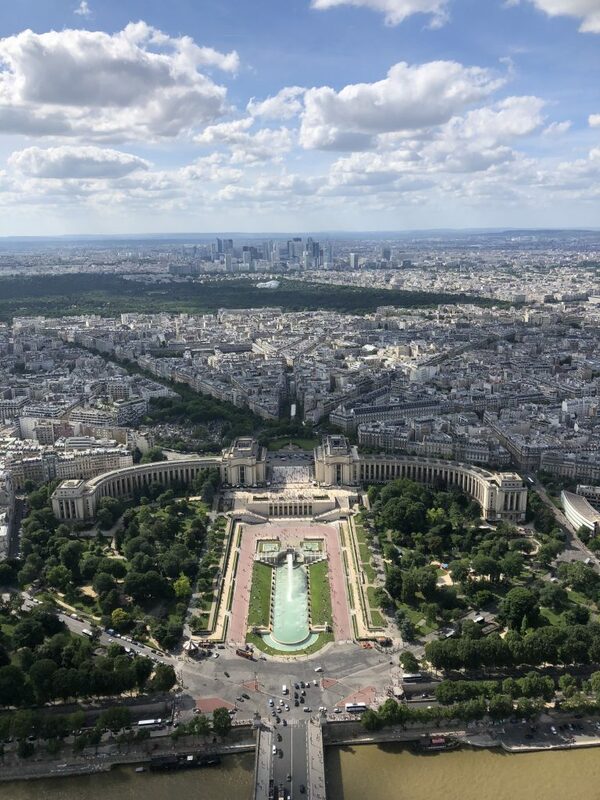 This view was one of the best views of Paris, and I could see for miles. 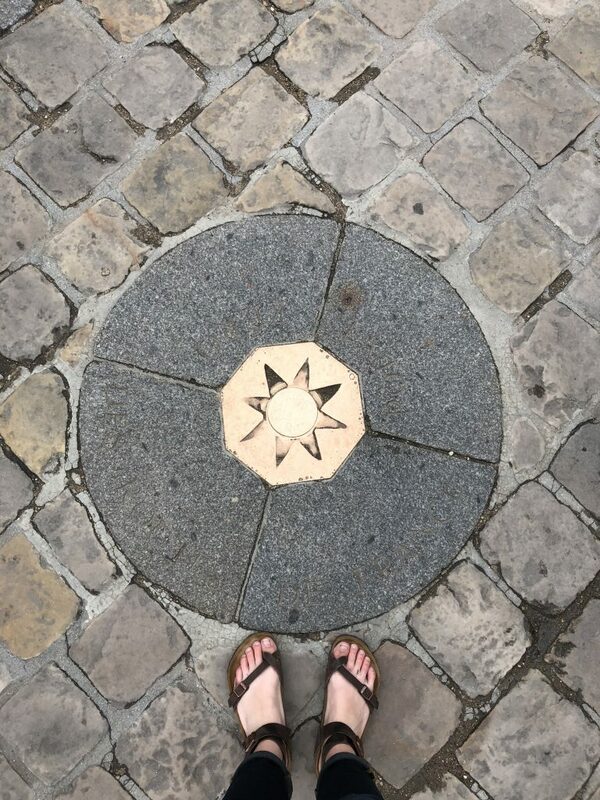 After climbing down from the tours, I stood at the famous Point Zero marker, which is the direct center location of Paris. 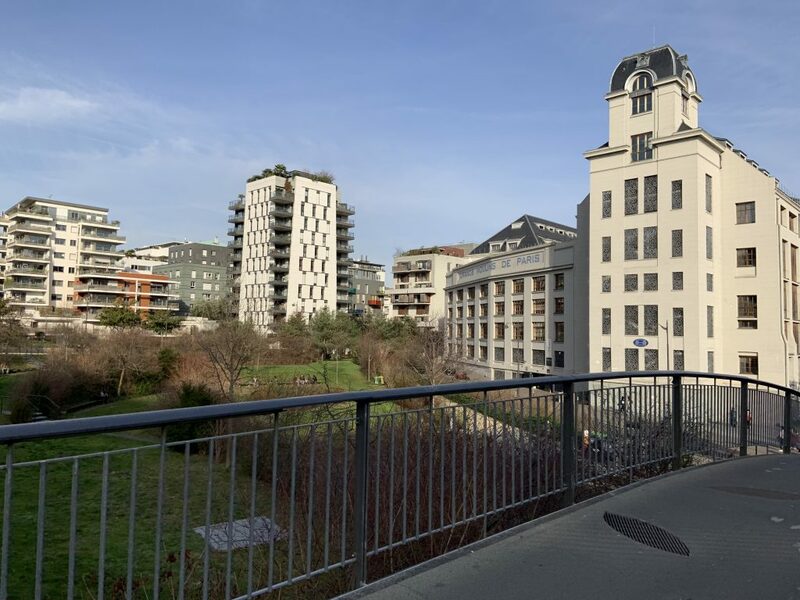 Since I have been living in Paris for the past month, something I have noticed is that Paris prides itself in being a very eco-friendly city. One of my favorite aspects of this is that almost all retail stores and grocery markets do not offer bags and expect customers to bring and reuse their own bags. I love this green idea and it is something unique to Parisian life. 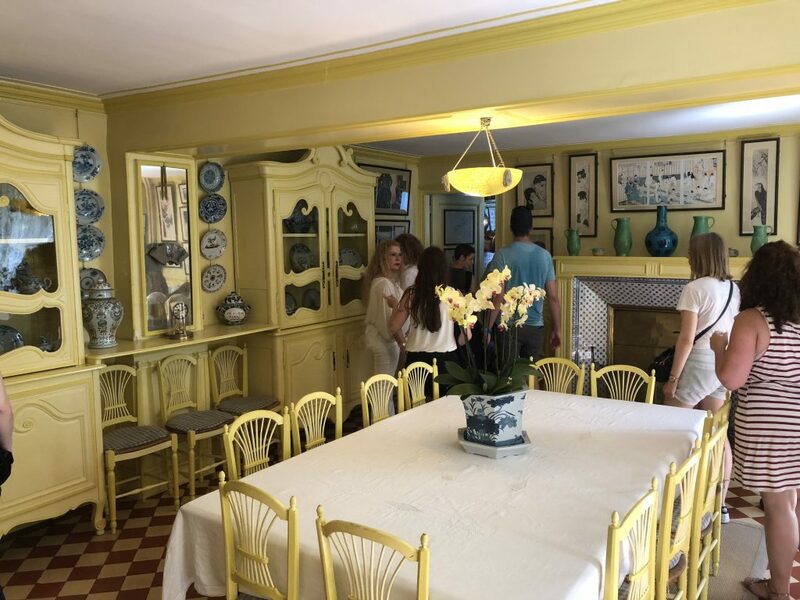 Posted on June 25, 2018 June 25, 2018 Author Alissa SmithCategories Culture, Daily LifeTags Europe/France, France, ies abroadLeave a comment on Claude Monet’s House and the Towers of Notre Dame! 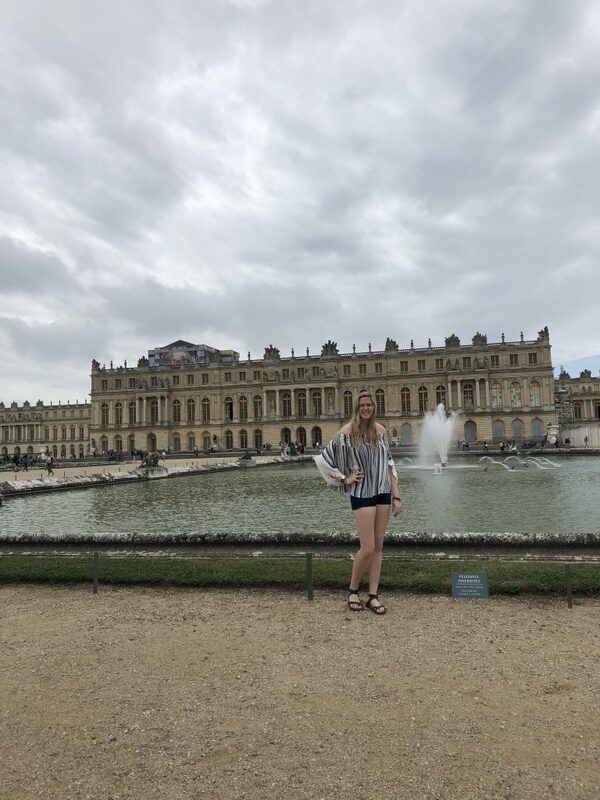 French Soccer, Versailles, and the Louvre! 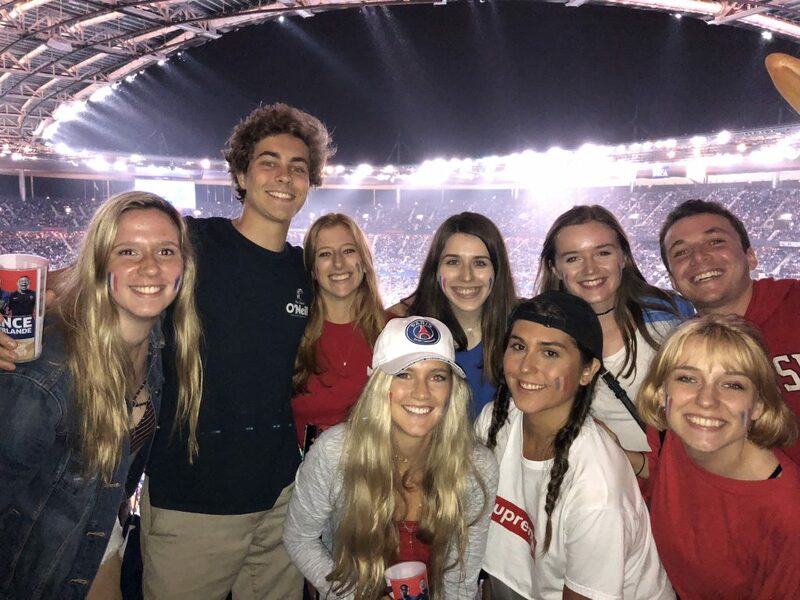 With the World Cup kicking off this weekend, my study abroad friends and I bought tickets to the World Cup send-off game of France vs. Ireland at the Stade de France. As an avid soccer fan, I was super excited to see one of my favorite national teams (France, of course!) take on Ireland. European soccer games are an exciting experience in itself. Fans were singing soccer fight songs throughout the metro rides, and the crowd at the game was even more rowdy. 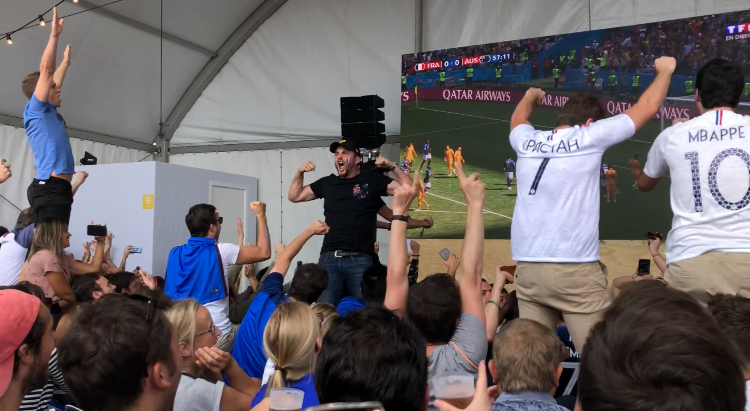 The French fans sang the national fight song throughout the entire game, successfully drowning out the attempts of the Irish fans trying to sing. My favorite part of the night was that we took a baguette into the game and used it to cheer with (yes, you read that correctly). 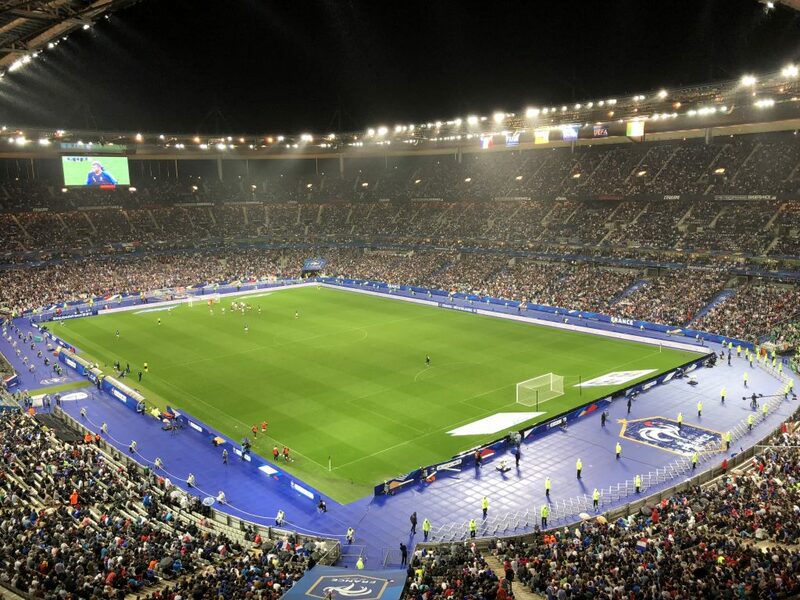 France defeated Ireland 2-0, and closed with a small World Cup send-off ceremony. We did get caught in a massive flash-flood on the way out of the game, which now we look back on and laugh about; mainly due to the fact that I ran barefoot because I love my Birkenstocks too much to see them get ruined! 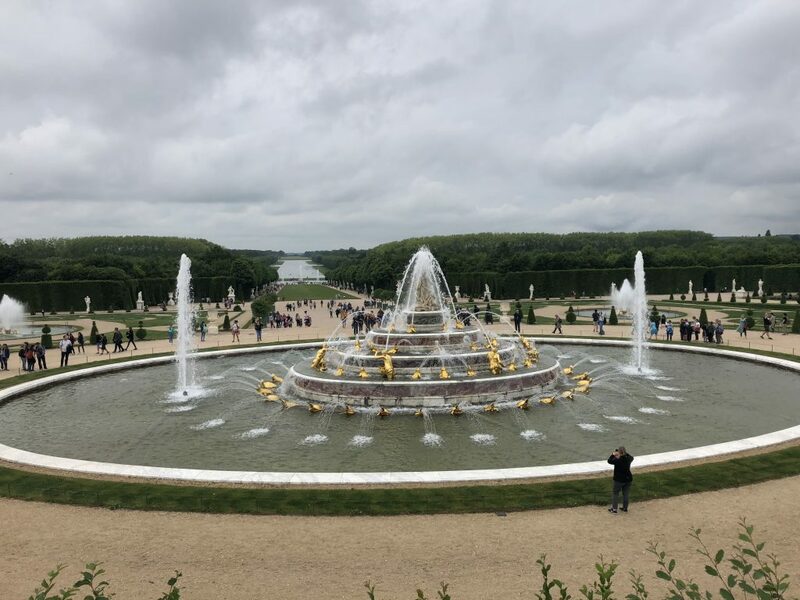 Later in the week for marketing class, our IES program took us to the Palace of Versailles. The palace itself is massive and covered in extravagant gold. 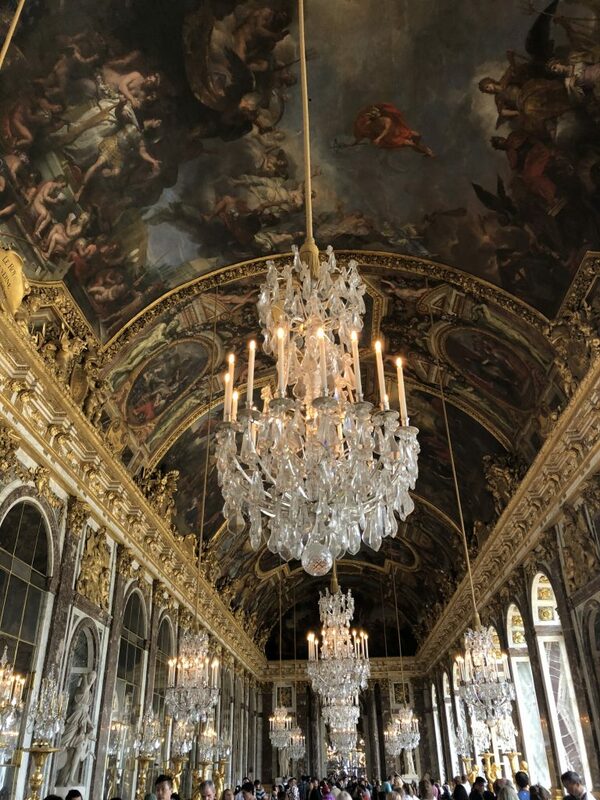 The inside houses hundreds of famous artworks, and of course the famous Hall of Mirrors. After touring the palace, we explored the backyard gardens. The gardens cover over one mile, including sculptures, fountains, and a hedge maze. At the back of the hedge maze, I found a small café hidden in the garden. This was one of my favorite places to eat, as it was very serene and peaceful. 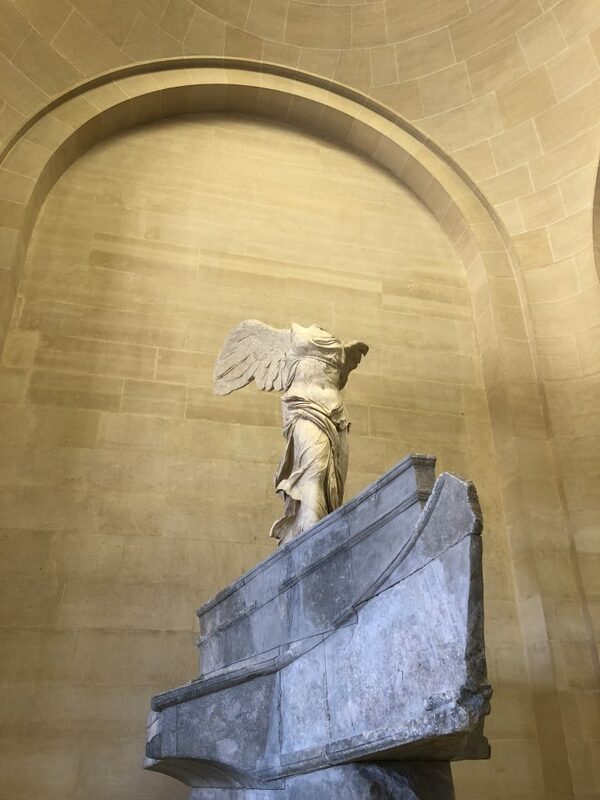 On the weekend, I decided to take on the true challenge of Paris: tackling the Louvre. 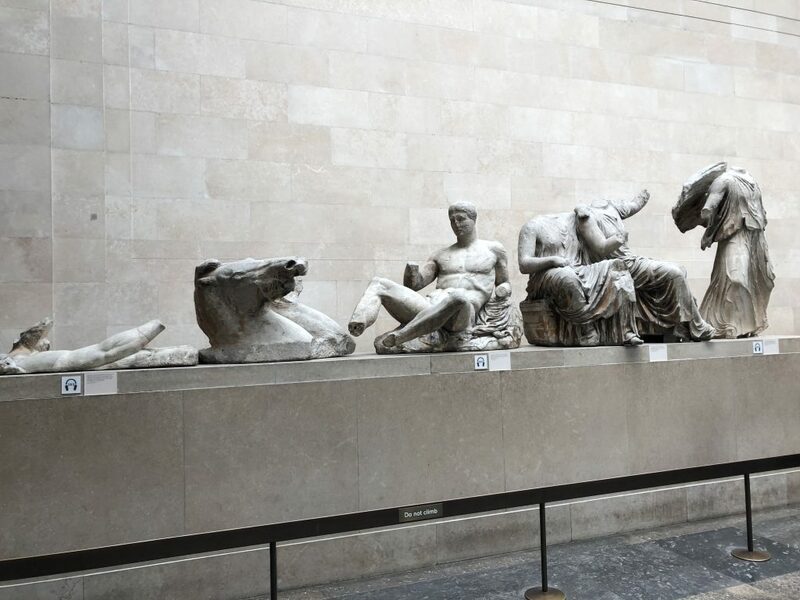 The Louvre has over 35,000 pieces of art and several floors. I started very early in the morning and followed a plan to see the artworks I was most excited about. My favorites included the Mona Lisa, Venus de Milo, Winged Victory, and the Egypt exhibits. 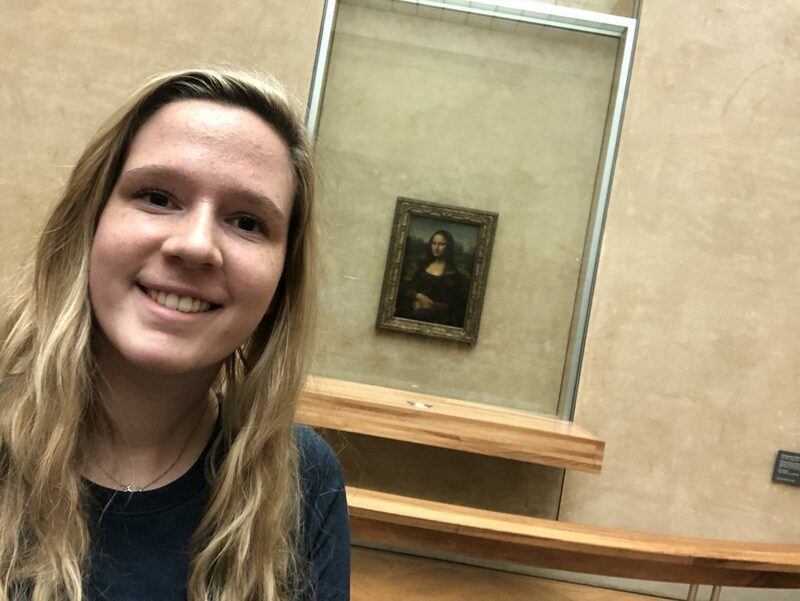 I explored the Louvre from opening to closing time, and saw everything I planned and more! 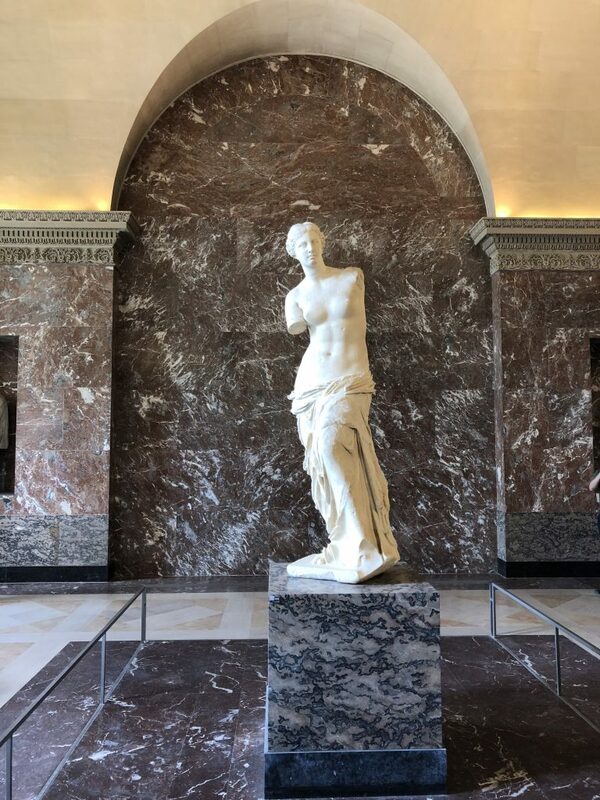 I absolutely loved the Louvre, as there were so many timeless pieces of art history. A few hours in, I found my absolute favorite piece of art. I stumbled across it on accident, and fell in love with the intricate detail. 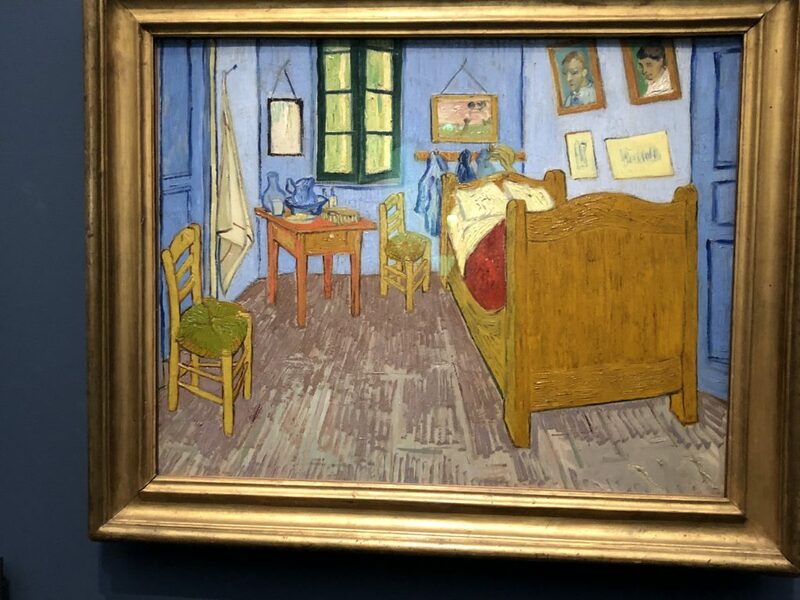 I also thought it was funny that this painting is actually a painting of other famous paintings. 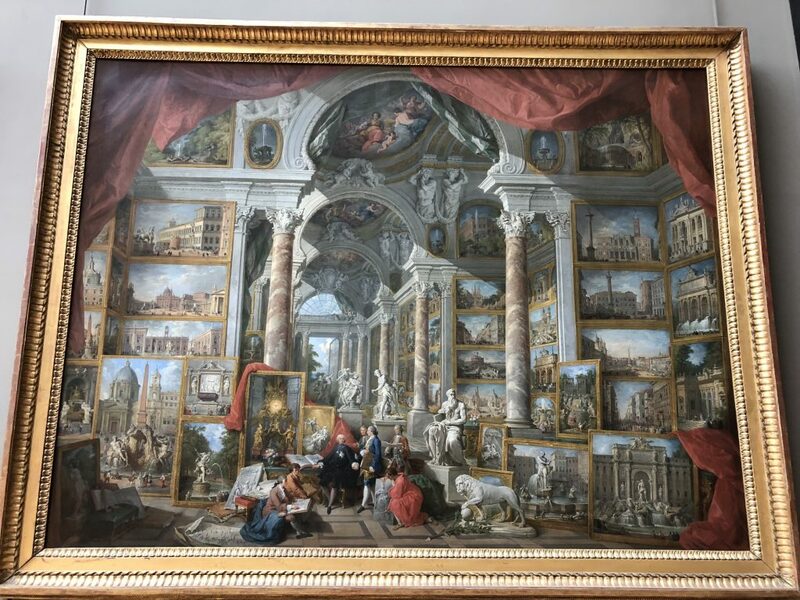 The piece is called Gallery Views of Modern Rome by Giovanni Paolo Panini (attached below). 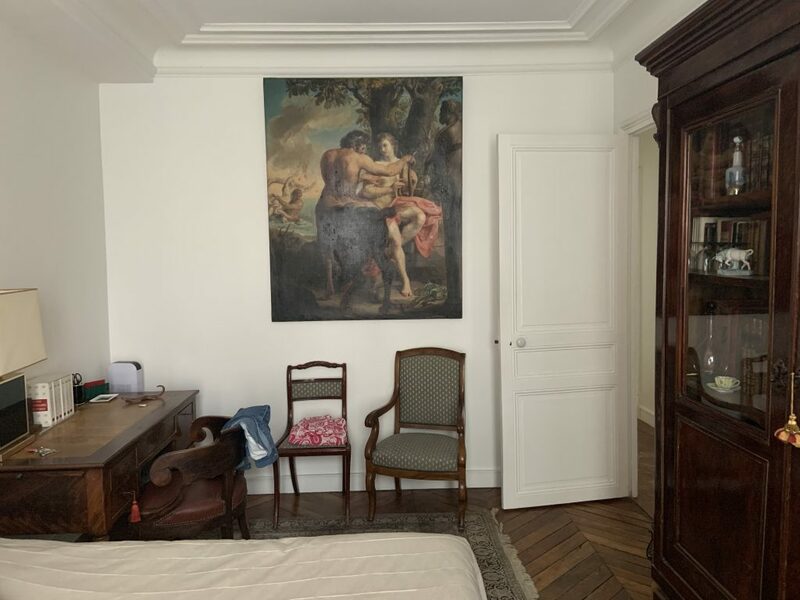 The room this painting hangs in was completely empty, so I was able to enjoy the art peacefully which is rare in the Louvre. 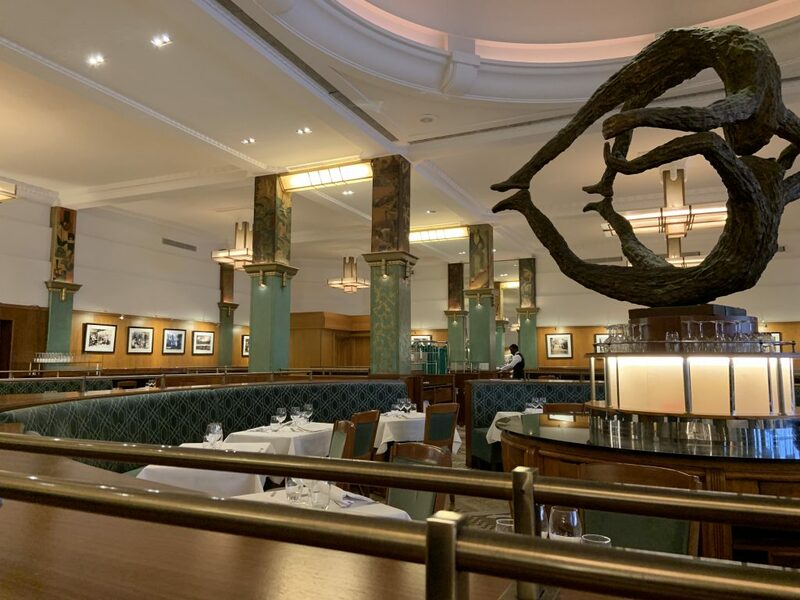 After hours exploring the Louvre, I ate at Café Marley which overlooks the Louvre courtyard. The Louvre is a massive museum, but definitely one of my favorite places in Paris. I hope to come back to see even more art at the Louvre! 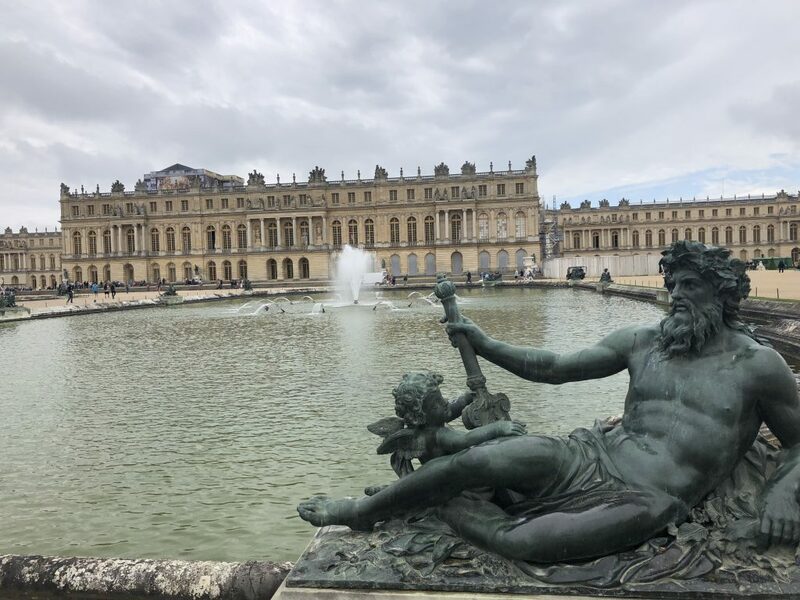 Posted on June 18, 2018 June 25, 2018 Author Alissa SmithCategories Academics, Culture, TravelTags Art, Europe/France, France, ies abroad, soccerLeave a comment on French Soccer, Versailles, and the Louvre! Latin Quarter and First Day of Classes! The other class I am taking here in Paris is Global Marketing with Professor DeGendre. I absolutely love this class and it is super interesting. We learned about how companies change their advertising campaigns to match the culture of a country. McDonald’s was a unique example I found interesting, as the McDonald’s here in Paris has a very fancy interior, a different menu, and also serves macaroons! I hope to have a career in international marketing, so this class is great experience! 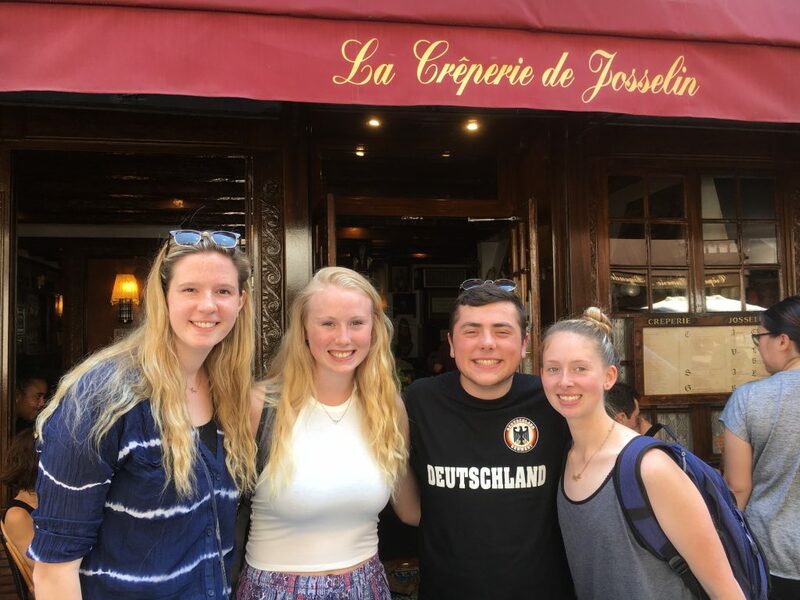 After class and lunch, our group decided to take the metro and tour the Latin Quarter of St. Germain des Prés. The Latin Quarter is the oldest area of Paris and contains all of Paris’ old universities. It is known as the Latin Quarter because the universities used to only teach classes in Latin. We also visited the famous cathedral of Notre Dame and the royal chapel of Saint Chapelle. 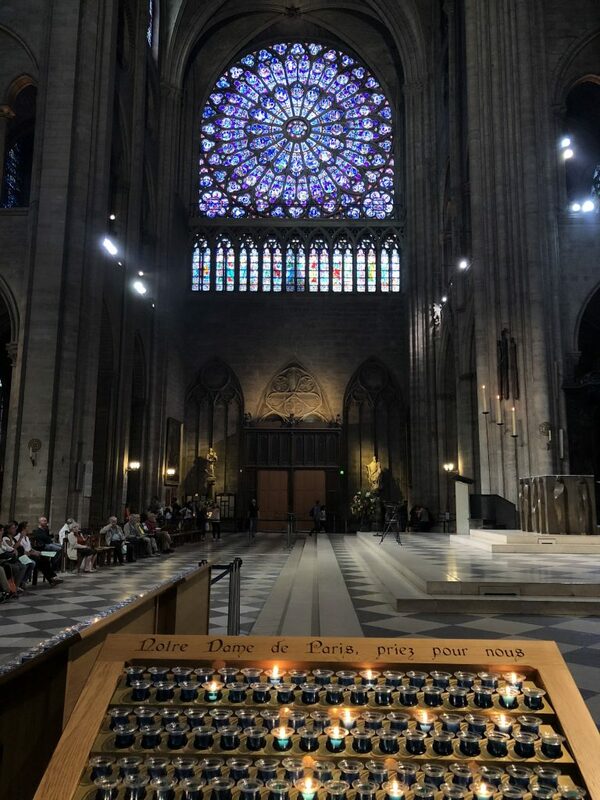 Notre Dame is famous for its two large towers that I plan to climb to the top of sometime, while Saint Chapelle is famous for its extensive stained glass walls. 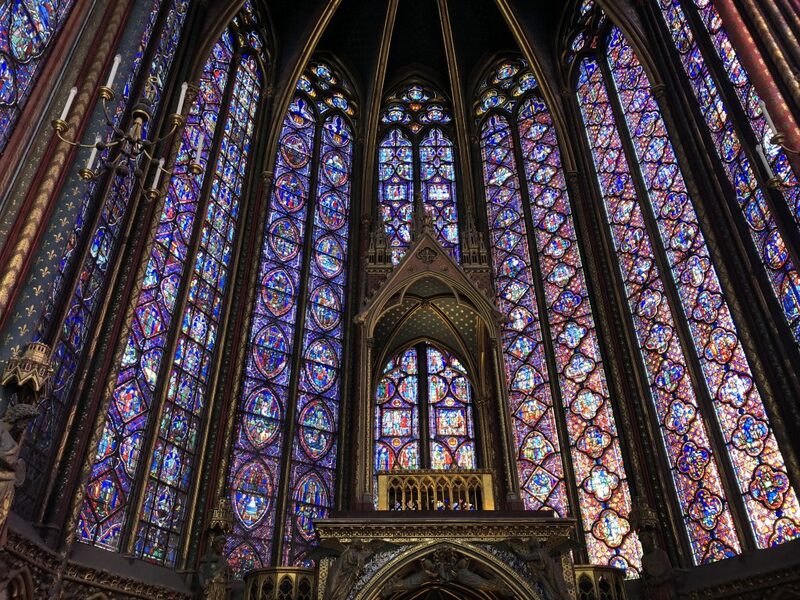 My personal favorite is Saint Chapelle (bottom photo) because the intricate details on the stained glass are amazing. No two panels are alike and the glass is hand painted. 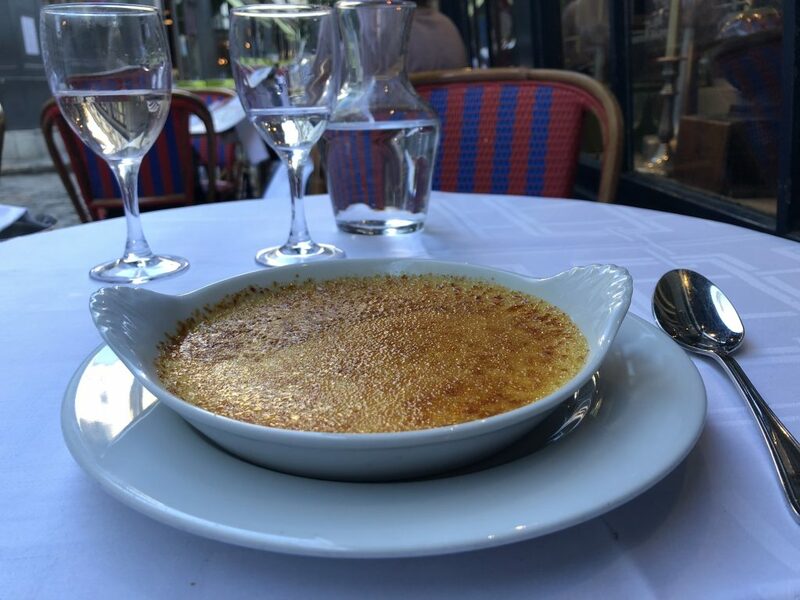 Since the Latin Quarter is famous for being the oldest area of Paris, I of course had to eat at the oldest restaurant in Paris. I ate at Café Procope, which was established in 1686 and is still open. I sat outside in the back alley as I was served duck and crème brûlée. This was definitely the best meal I have ever had (and probably one of the fanciest)! 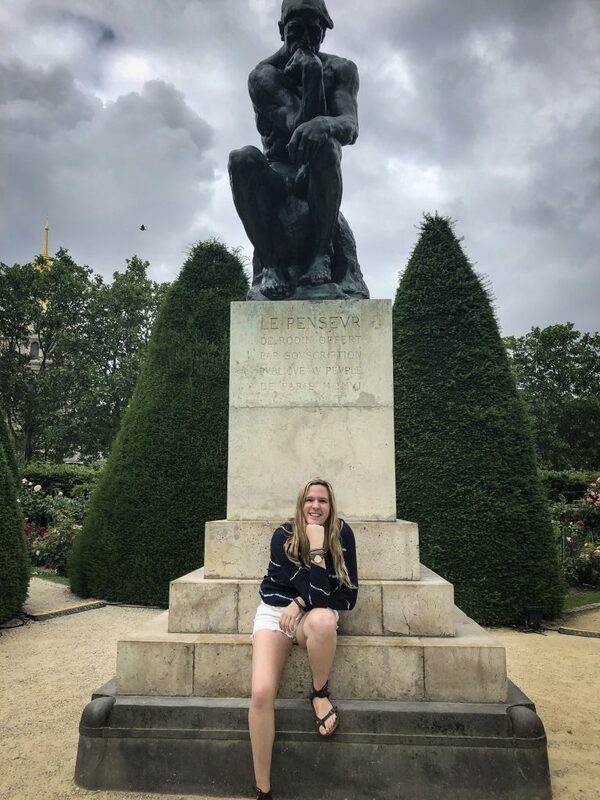 Posted on June 7, 2018 June 18, 2018 Author Alissa SmithCategories Academics, CultureTags Europe/France, France, ies abroad, ParisLeave a comment on Latin Quarter and First Day of Classes! 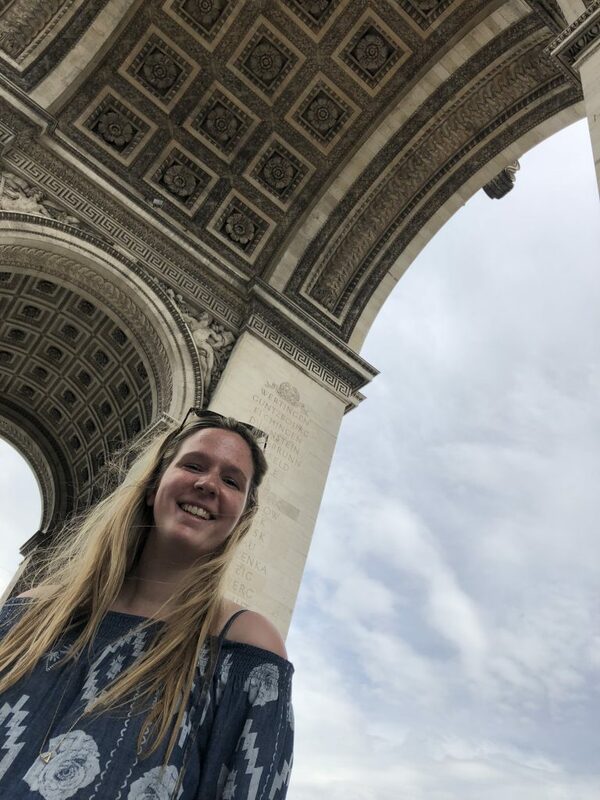 Arc de Triomphe, Seine Boat Tour, and Champs Elysees! 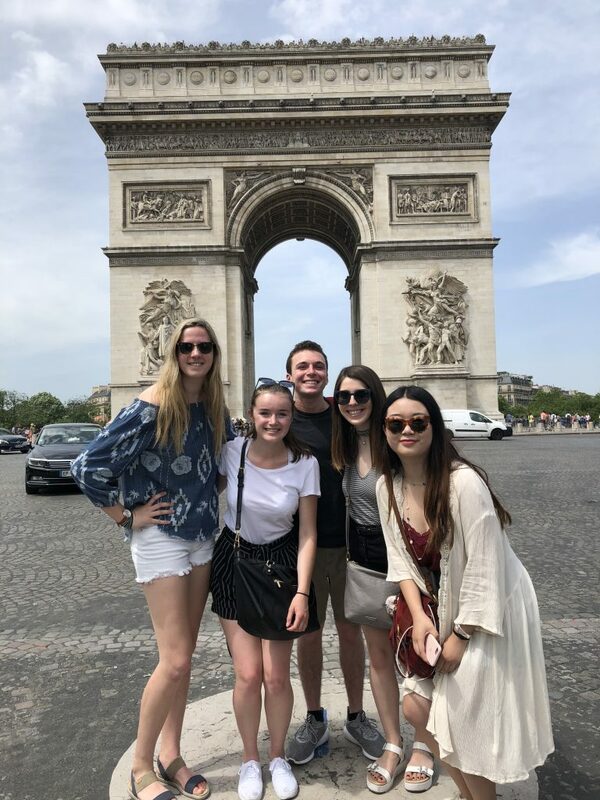 What is a summer studying in Paris without a visit to the Arc de Triomphe? This was one of the monuments I was most excited to visit! Something I did not know is the only way to access the Arc de Triomphe is to cross the street through an underground tunnel because the street is so busy all the time. 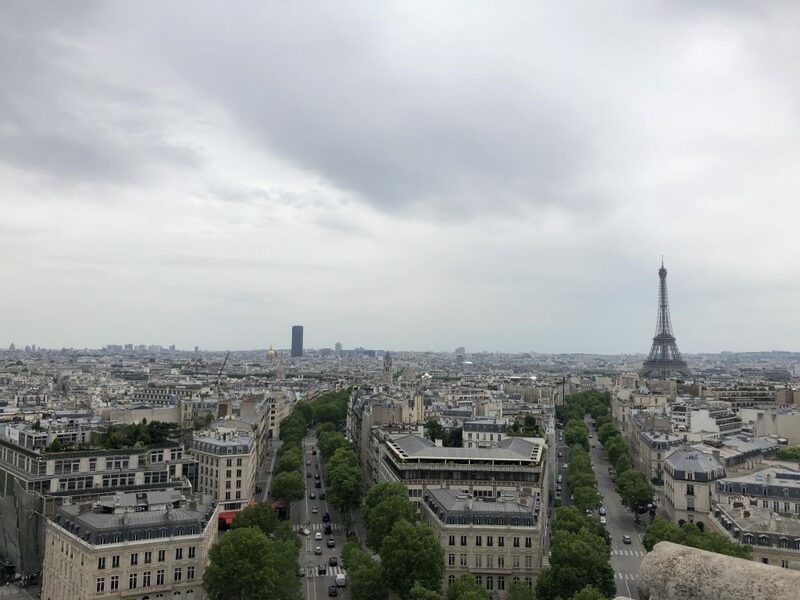 Once we got to the Arc, we decided to climb the tons of stairs to the top for an amazing view of Paris. Our IES group also took a boat tour on the Seine to see all the famous locations of Paris. We learned the history of each monument, and saw all of Paris within a few hours. One of my favorite monuments is the Pont Alexandre III bridge, pictured below, which is the most ornate and extravagant bridge in Paris. 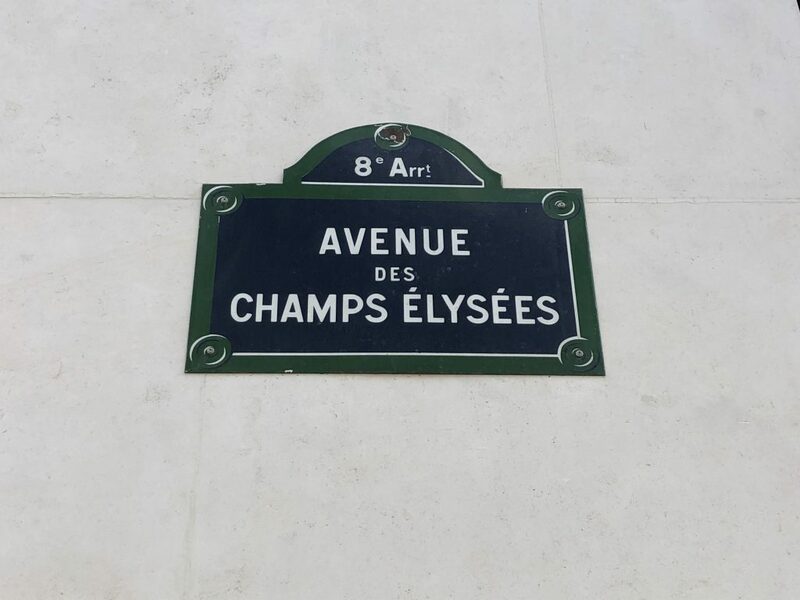 Later on, we went shopping on the famous Champs Élysées. 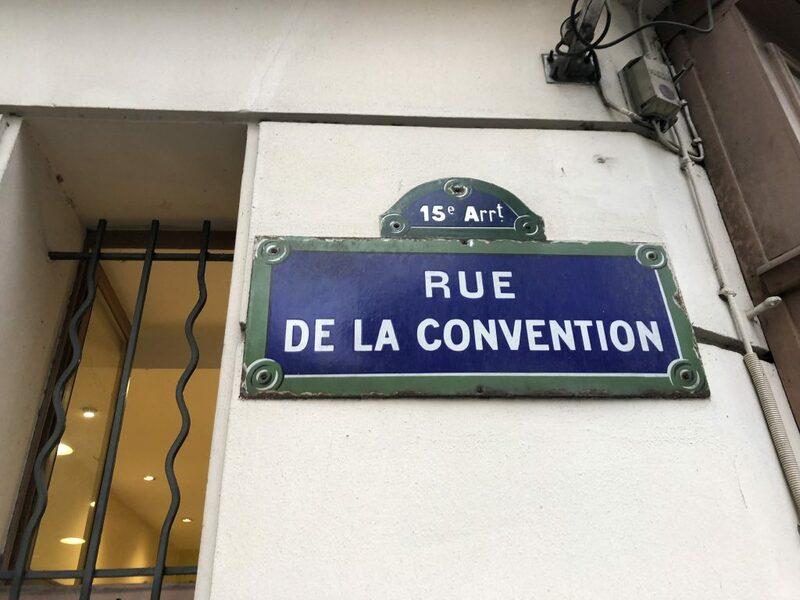 This street houses all of the most expensive stores in Paris, ranging from Louis Vuitton, to Gucci, to Versace. 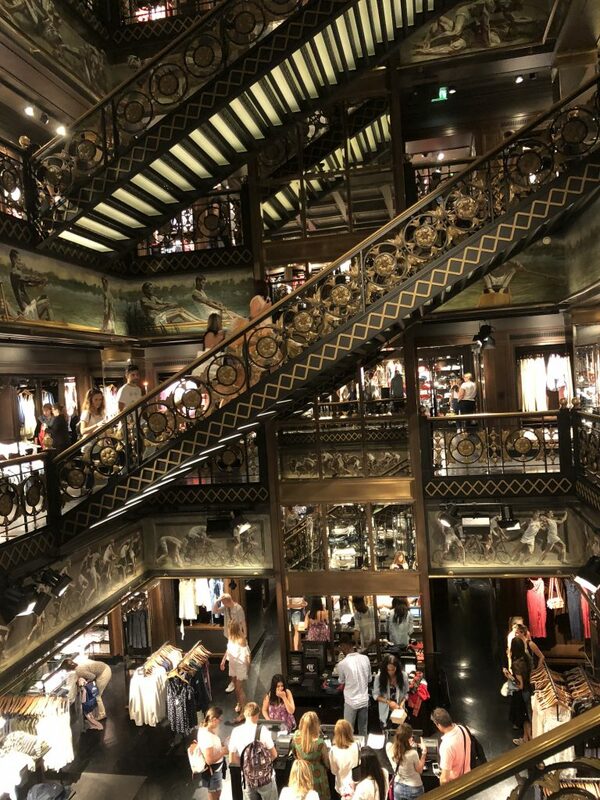 We soon realized we were the most under-dressed customers, but still had a ton of fun window shopping. While on Champs Élysées, we stopped at Ladurée, the most famous macaroon store in France. I had a lavender macaroon and it was one of the best desserts I have ever had. I will definitely have to buy a box before I leave! 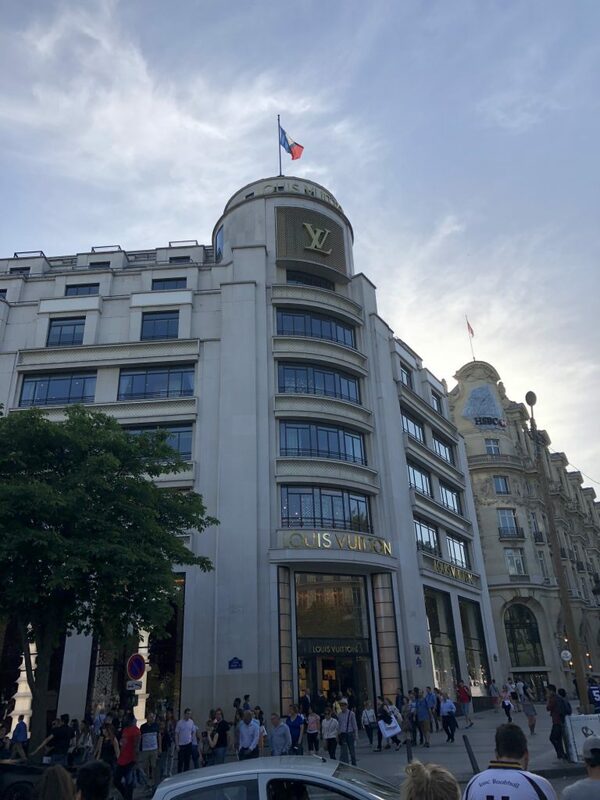 Posted on June 4, 2018 June 4, 2018 Author Alissa SmithCategories Culture, TravelTags Europe/France, France, ies abroad, ParisLeave a comment on Arc de Triomphe, Seine Boat Tour, and Champs Elysees!